When we got back from England, I couldn’t bring myself to go for a walk. 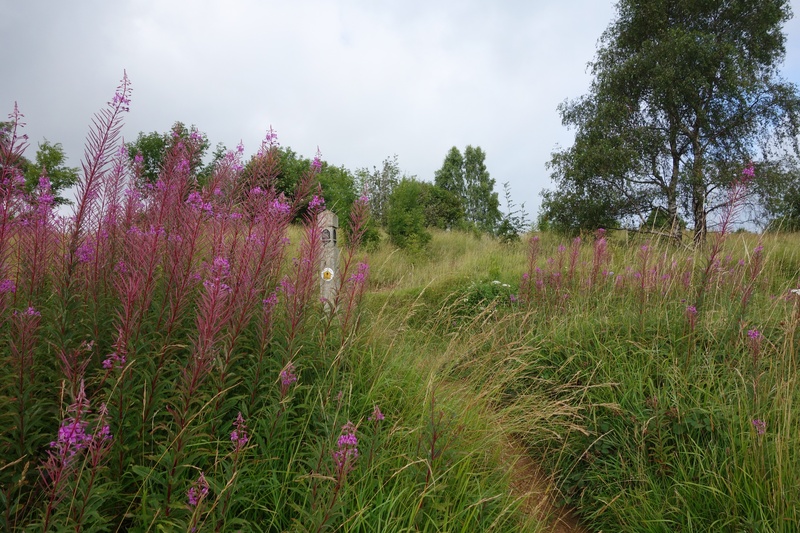 After tramping across fields and pastures and through beech forests, I couldn’t reconcile myself to walking on the paved paths around our artificial lake or along a grid road across the flat prairie. To make things worse, some of the park’s little gravel paths have been paved over since we went on our vacation. 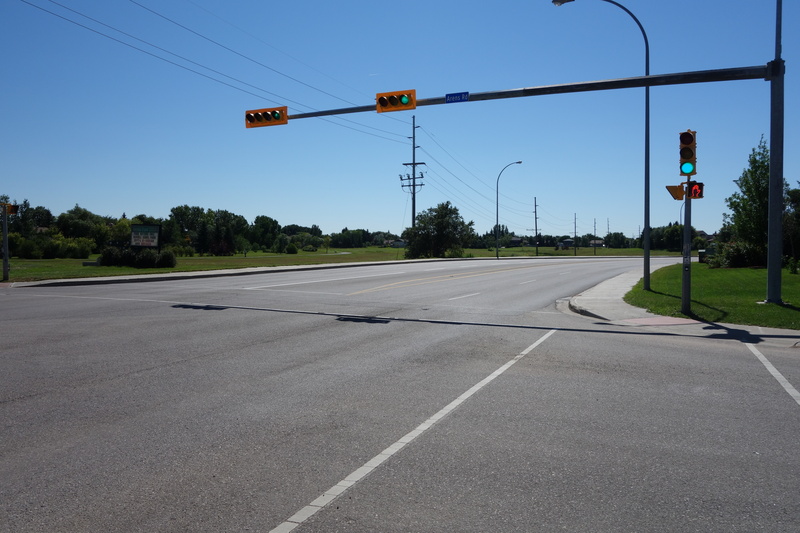 Asphalt, it seems, is considered an improvement by the Wascana Centre Authority. I disagree. Don’t get me wrong: this city has many good points, but it’s not the best place to go for a walk. I had to get out of my funk, so on Wednesday I got Christine to drop me off at the farthest point in the city’s northeast I could think of: in front of the Correctional Centre. 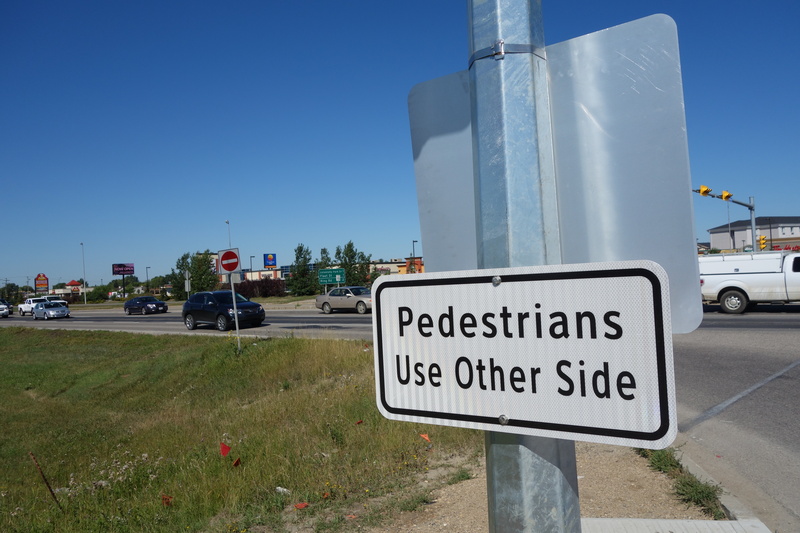 (It’s adjacent to the landfill; don’t ever think that city planners lack a sense of irony.) 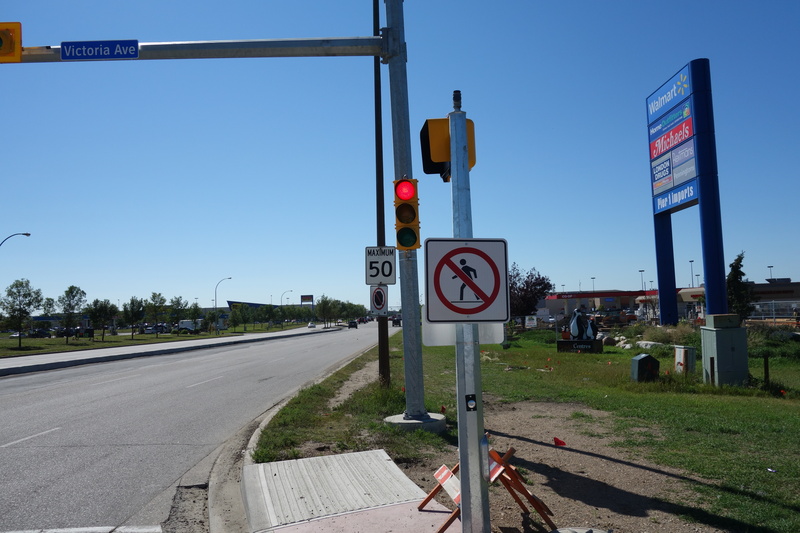 From there I walked to the city’s southwest, a shopping development named “Grasslands,” where I would call to get a lift home from a bar named after both a CFL football legend and a bomber from the Second World War. Whatever else happened on my walk, I was going to get a glass of draft beer at the end of it. 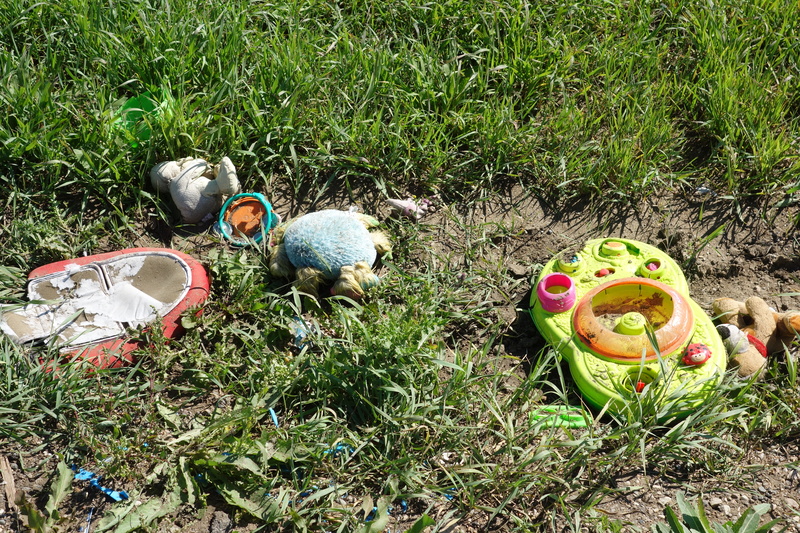 Nothing much happened on my walk across town, to be honest. I passed maybe 10 other walkers in total, and most of them looked like they were too young to have a driver’s license. A couple of them smiled at me; another frowned. Cars and trucks passed me by. 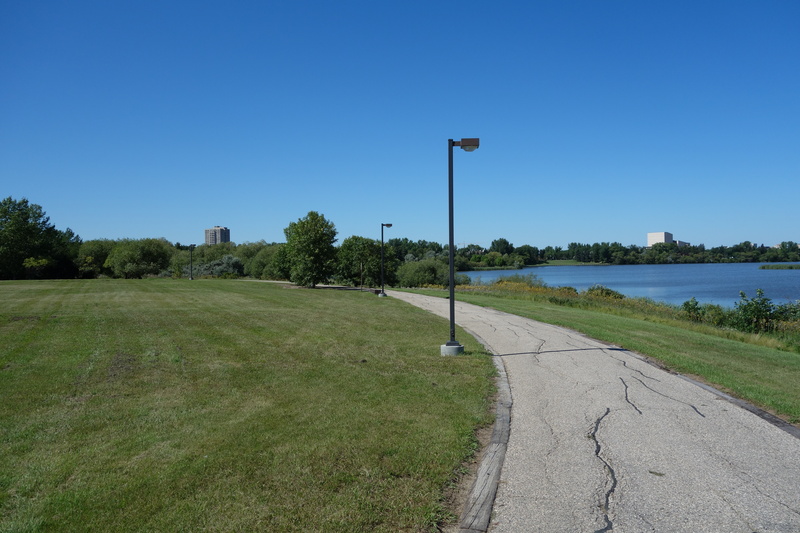 I walked through the big-box developments in the city’s east end, along the lake past the university, through a couple of suburban neighbourhoods, and then to my destination. It only took a little over three hours, and when I mapped out my route later, I discovered that it was just 17 kilometres long. 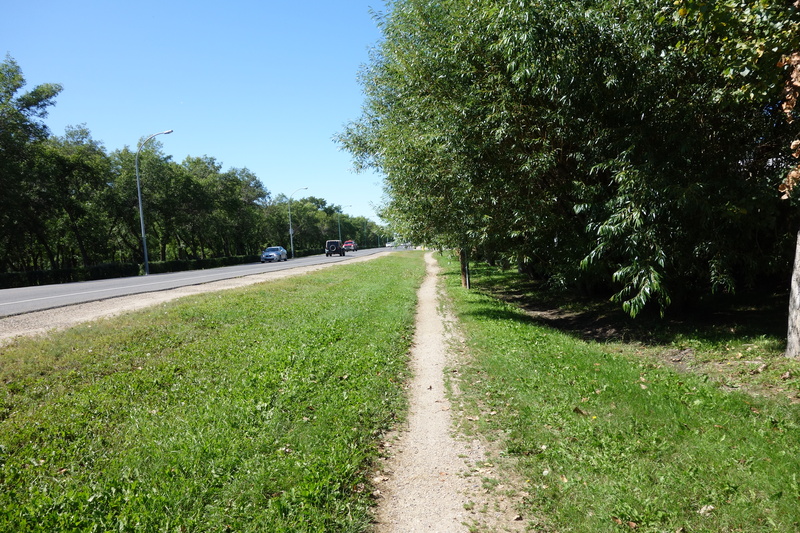 For most of my route, I walked along sidewalks, but for the first hour or so, there weren’t any. I think I read something about Brasilia once, mocking that city’s designer for leaving sidewalks out of the plan, as if no one was ever going to need to walk there. 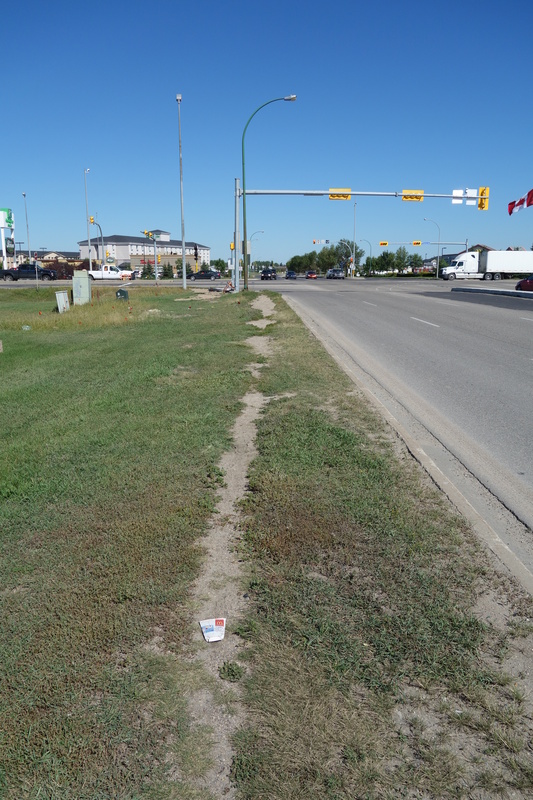 Maybe North Americans shouldn’t be so smug, since our suburbs are designed without sidewalks, too. 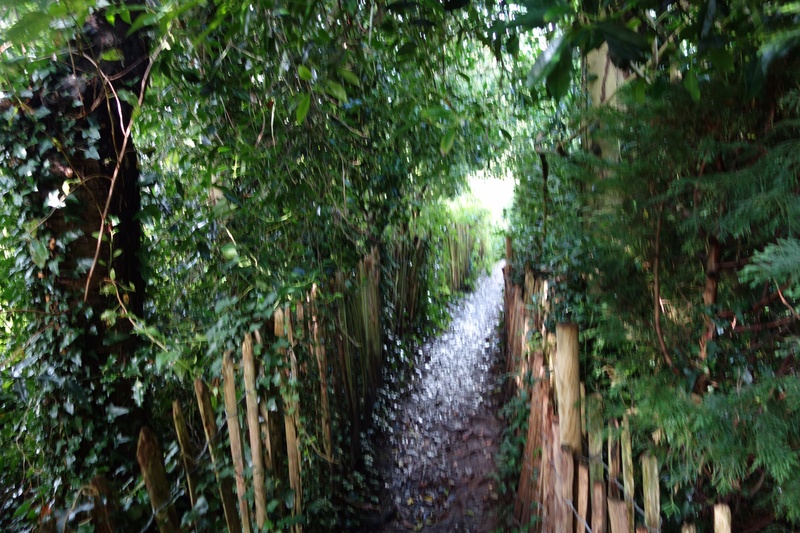 Very few people walk there, of course, some do–enough that the paths left by their feet are sometimes visible. 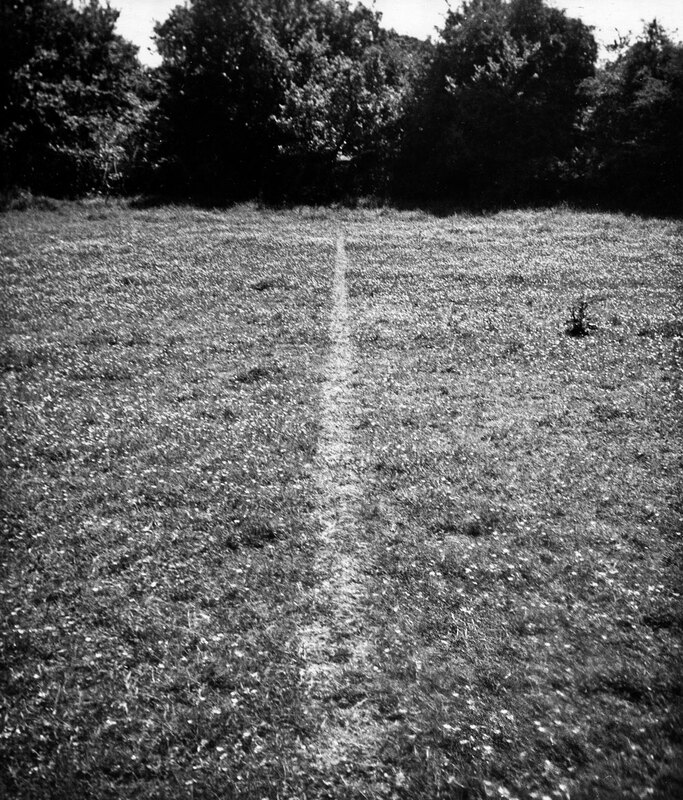 I thought about Richard Long as I walked. 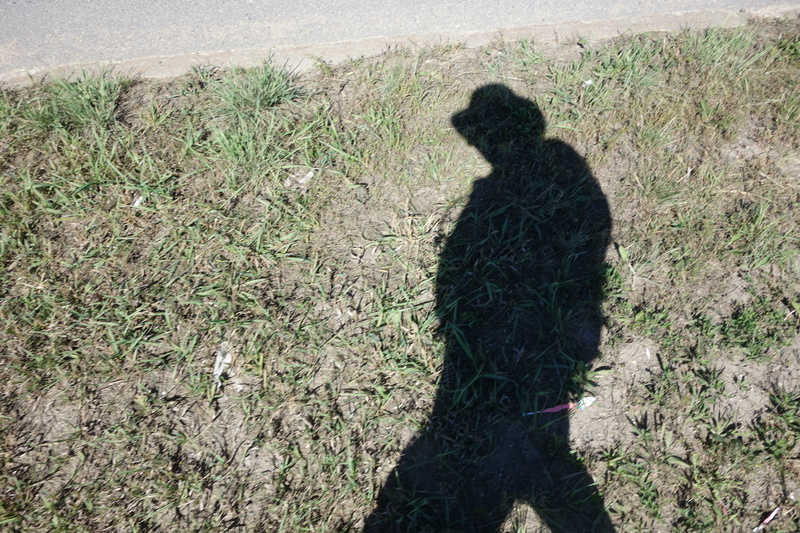 I’d just started to read a book about his work, and in particular the piece that made his name, called “A Line Made By Walking.” Long just walked across a pasture until the path his feet made was visible, then took a picture. The piece, according to the book’s author, Dieter Roelstraete, “belongs to the histories of early Conceptual art, Land art . . . performance or body art, Arte Povera . . . conceptually inflected experimentation in photography” and, most of all, “‘non-object art. '” I don’t know what some of those things are, and I need to finish Roelstraete’s book, I suppose, if I’m going to find out. Since then, Long has continued to walk and take photographs of his journeys. Christine brought me one of his books back from Edinburgh a few years ago: A Walk Across England. I don’t know a lot about art, and I struggle to understand how something akin to what I did on Wednesday could be considered art, but I like Long’s photographs, and I admire his athleticism. 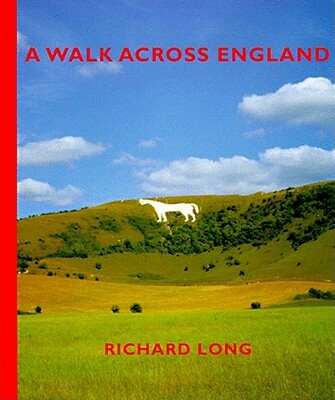 I know that sounds like a strange word to use to describe walking, but it seems to fit in this case: according to the book’s title page, Long covered 382 miles in 11 days, walking across England from the west coat to the east. That’s an average of almost 35 miles, or 55 kilometres, per day–an astonishing distance, especially given the fact that his gear included a tent and, since it was 1995, a heavy film camera. I can’t walk that far in a day; my longest walk has been 35 kilometres, so I’m in awe of Long’s ability to cover long distances. Perhaps what makes Long’s walks art is simply his intention: he sets out to make art. Or perhaps it’s just that he calls them art. I don’t know. Again, Roelstraete’s book might enlighten me. It’s heavy going, though, and I prefer looking at the pictures in A Walk Across England. When I arrived at the pub, the Heart and Stroke Association was there with a bicycle the size of an 18-wheeler. It was being driven around by employees of the Royal Bank. After each group of cyclists finished their ride around the parking lot, they came into the bar to recover from their efforts. It looked like a fun team-building exercise, but I’m not sure it was doing much to prevent cardiac or vascular disease. Maybe that wasn’t the point. When Christine arrived, we had a drink and then she drove me home. I’m not going to walk that route across town again. I knew it would be ugly and desolate, and it was. 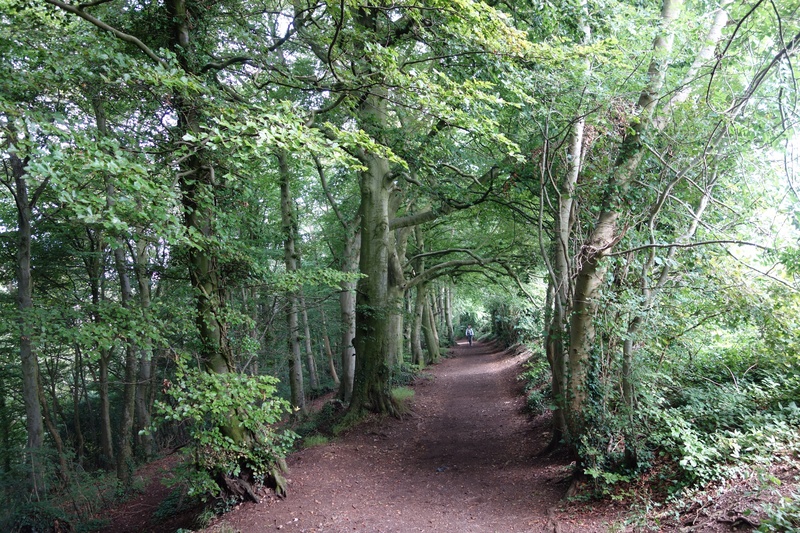 But it was a walk, and I’m going to have to accept that not every walk can be as pretty as the Cotswolds. That’s just not how it is. 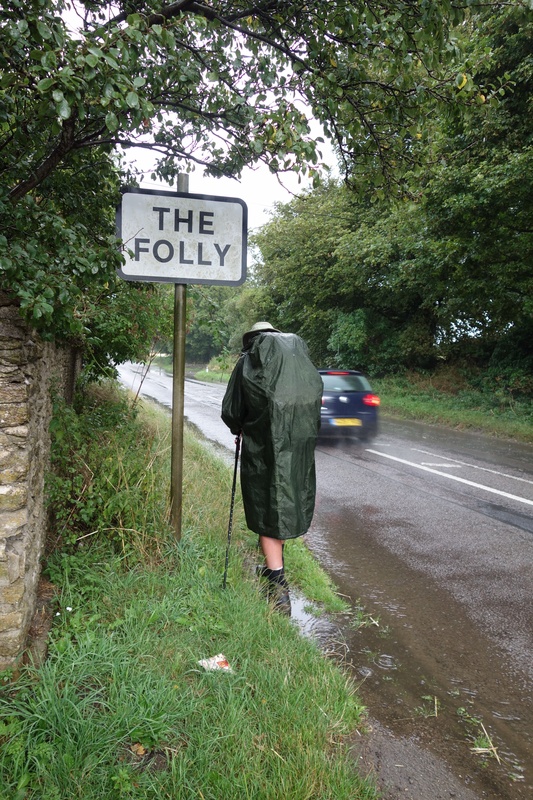 I’ve already been asked if I’d walk the Cotswold Way again. The answer is yes, but also no. Yes, I would love to go on another walking trip–I’d leave tomorrow if I could. But I’m not sure I’d walk in the Cotswolds again. It was beautiful but there are many other places I’d like to walk before I return there. That doesn’t mean that I didn’t enjoy it, though, or that I wouldn’t recommend it to other people. 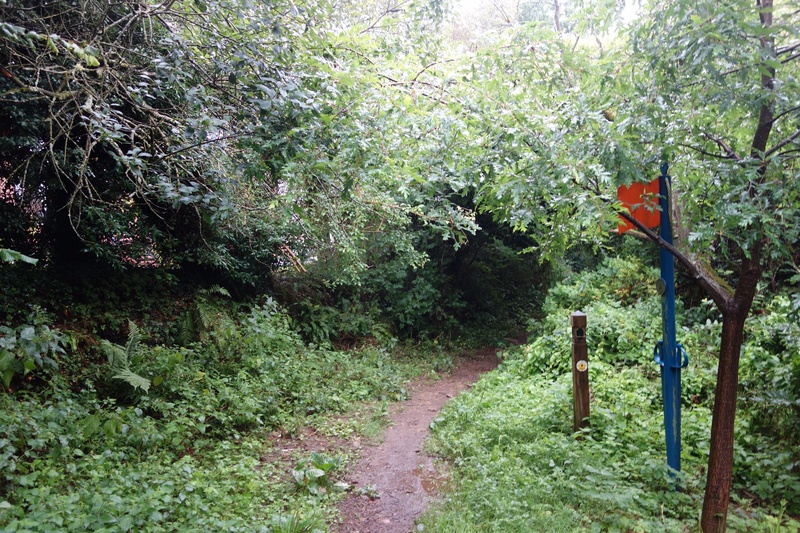 The trail is well-maintained and (for the most part) the waymarking is very clear. 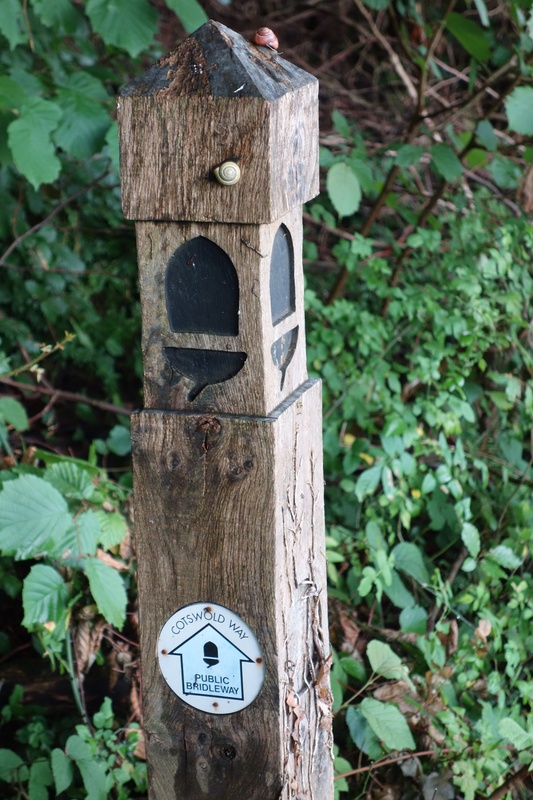 We met a couple from Cheltenham, a city in the Cotswolds, who told us that they started taking day walks along the Way because of their experience walking regular footpaths. 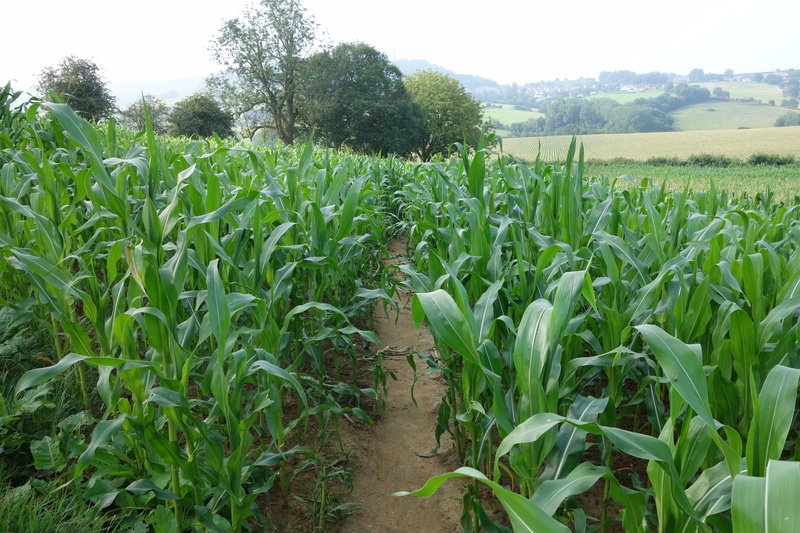 Often, they said, they’d end up stymied by locked gates or paths that had been ploughed over by farmers. 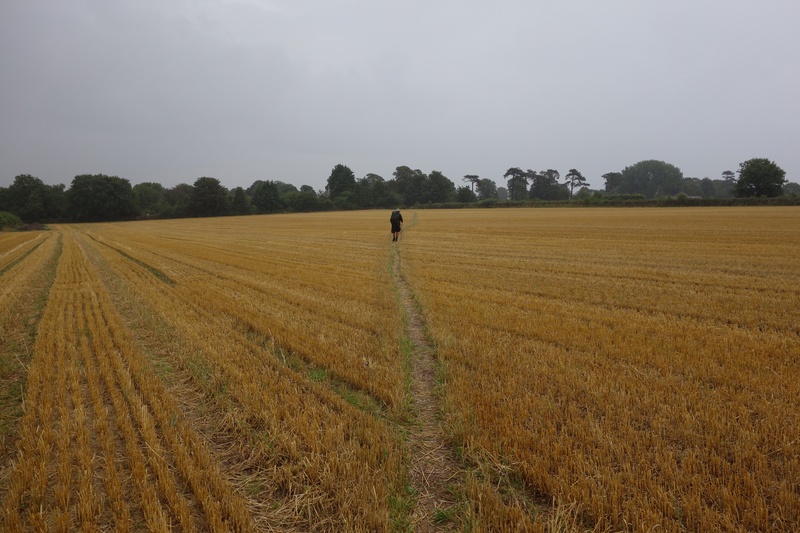 They found themselves having to climb through hedges–and since the hedges contain blackberries and stinging nettles, that would be (to say the least) an unpleasant experience–or wading through the mud of a recently ploughed field. 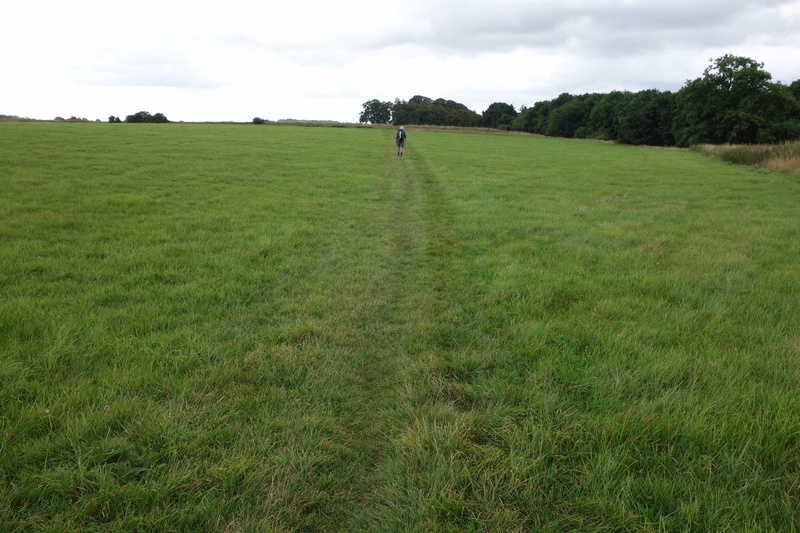 One day they ran across a Cotswold Way path. 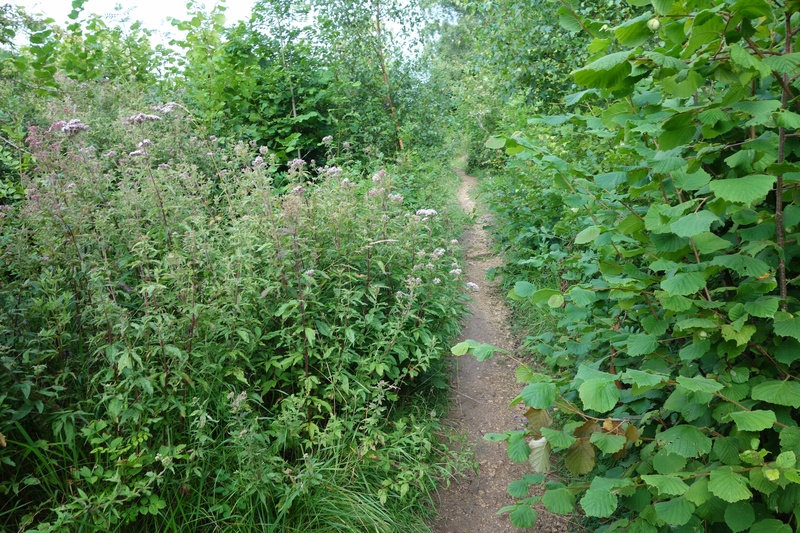 They were surprised by its good condition and decided they’d limit their country walks to the Way. My limited experience supports what they told us. 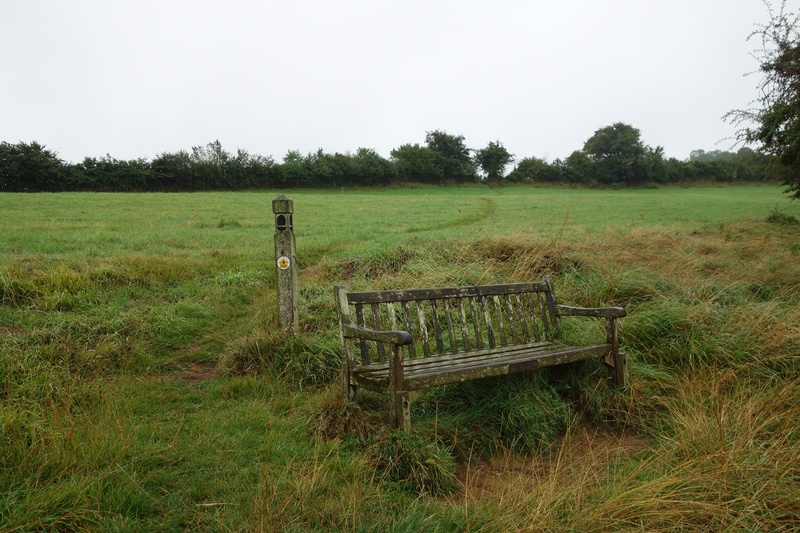 When I walked from Blenheim Palace to Oxford, the stiles and gates were in poor condition compared to what we found on the Cotswold Way. The volunteer trail wardens do an incredible job of making sure that the trail is well maintained. In fact, one of the ways you know that you’ve gotten off the path is the sudden drop in the quality of things like gates and stiles, which are suddenly old and half-rotten or kept closed by loops of twine instead of latches. 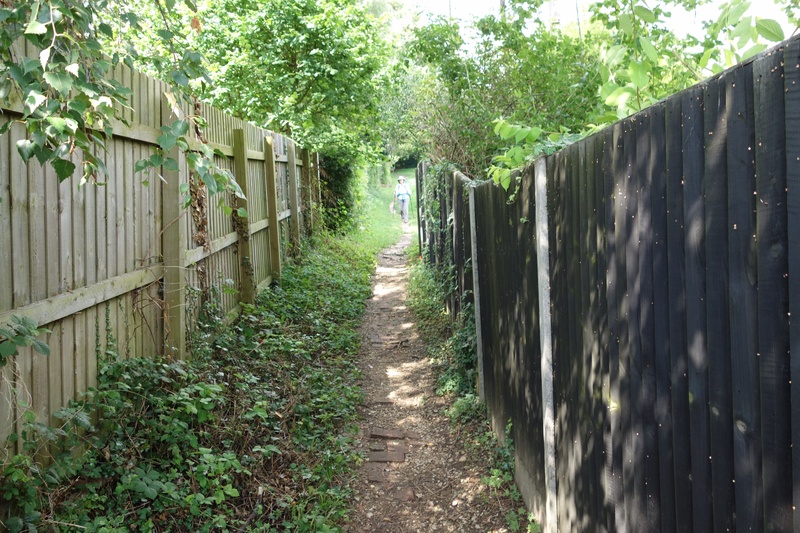 Obviously local councils have more pressing priorities than maintaining footpaths. What’s even more amazing is the fact that anything needed to maintain the Way, from gates to gravel, is provided through charitable fundraising. That doesn’t mean that the Way is groomed, though. It turns to slippery mud when it’s raining and sometimes, where gravel has been added to it (to stop erosion, I think) the stones are (as they were in Spain) large and hard on the feet. Also, because so few people walk on it (compared to the Camino Francés) it can be narrow and edged by tall grass. And while walking across grass pastures is easy on your feet, it also creates more friction and slows you down a little. We met a couple from Virginia who were unhappy with the condition of the trail, but I think their expectations were out of line. They must’ve been in their seventies and I think they were blaming the trail for the fact that they found it difficult. Because it is difficult–there’s no way around it. The hills can be steep and you have to watch where you put your feet sometimes. 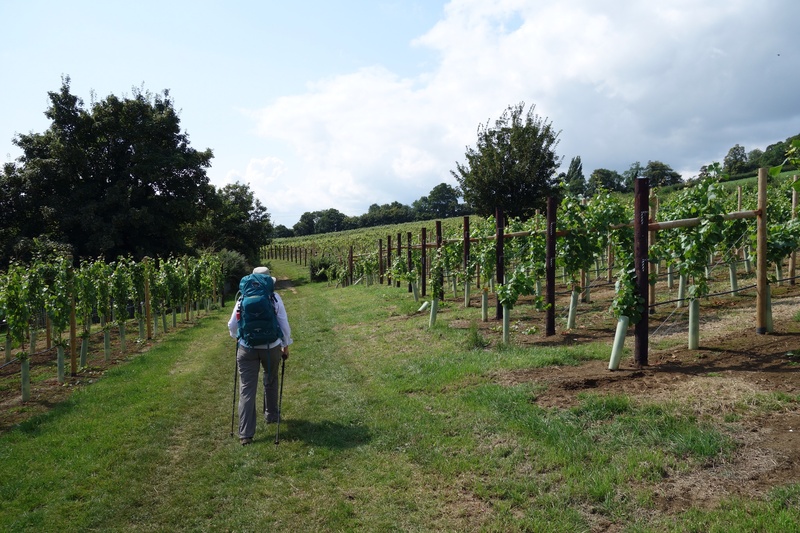 We were glad to have walking poles on the more challenging sections. 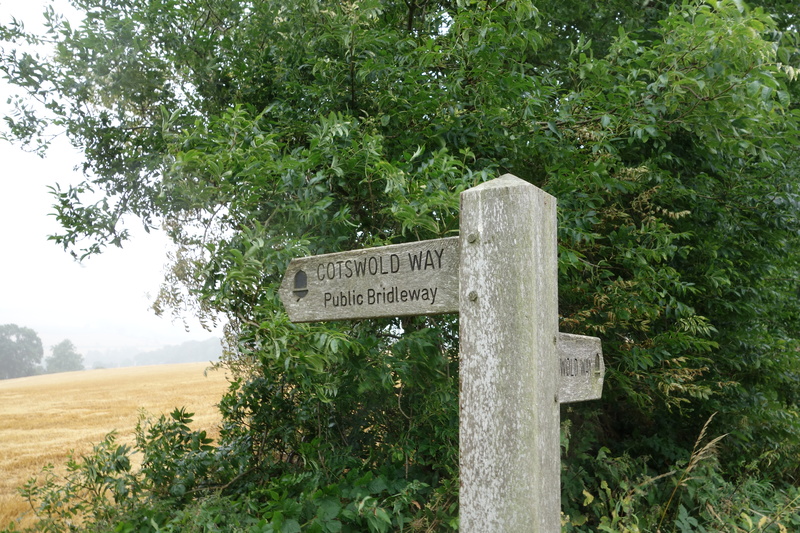 But I don’t think that’s unique to the Cotswold Way. 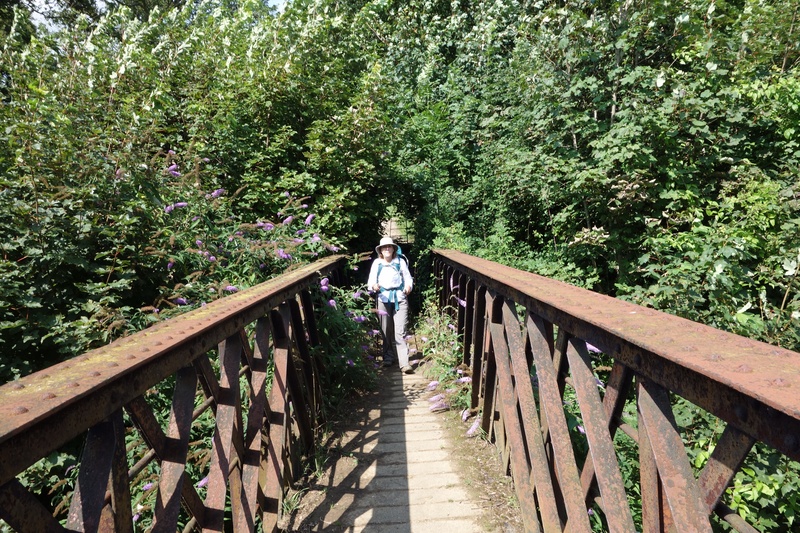 Parts of the Camino Francés are hard, too, and from what I’ve read other trails are even tougher. 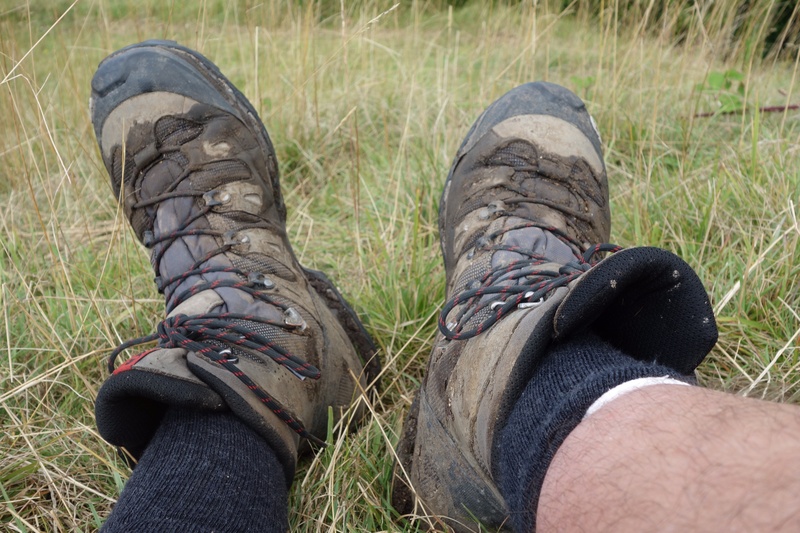 The only drawbacks to the Cotswold Way (aside from the expense of staying in B&Bs compared to albergues or hostels) are its length–you’re just getting into the rhythm of the walk, just starting to get fit enough to tackle the hills, when it’s over–and the fact that you don’t meet many other people who are walking from one end to the other. 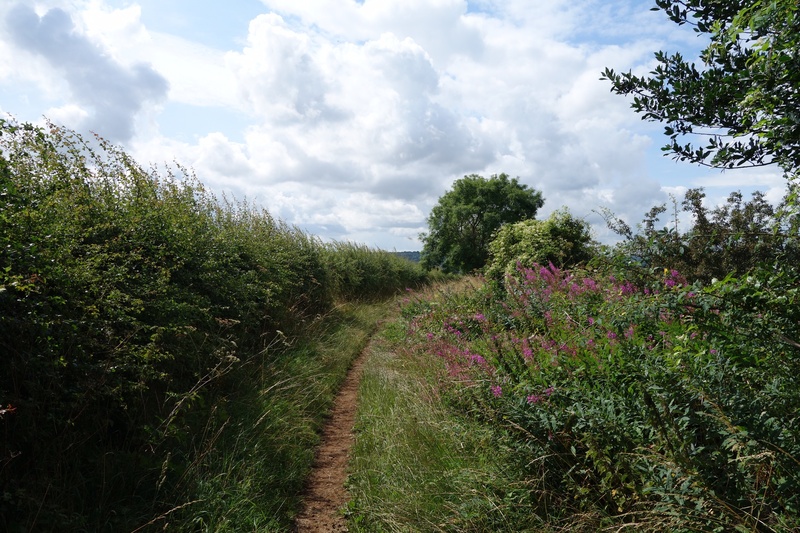 But if you have a week or ten days and the inclination to go for a walk through some achingly pretty countryside, the Cotswold Way is worth considering. 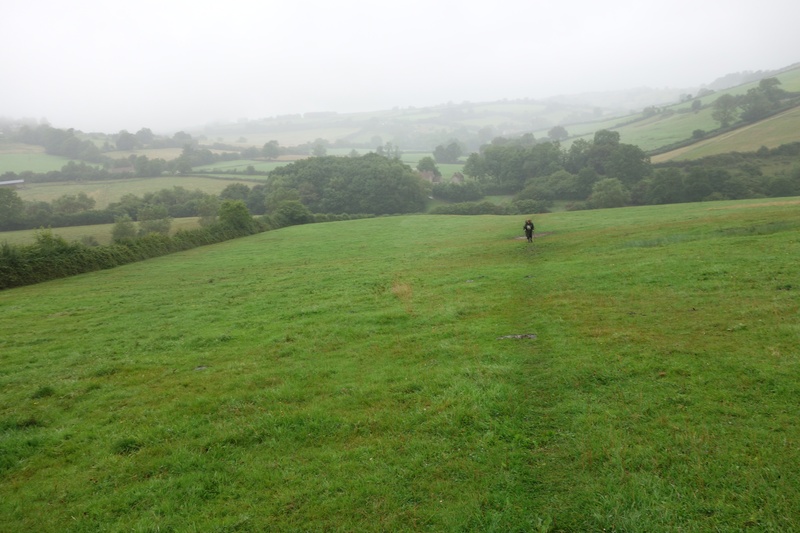 I started to read Robert Macfarlane’s book, The Old Ways: A Journey on Foot, while we were on the plane to England and I finished it while we were walking the Cotswold Way. I couldn’t have picked a better time to read it. 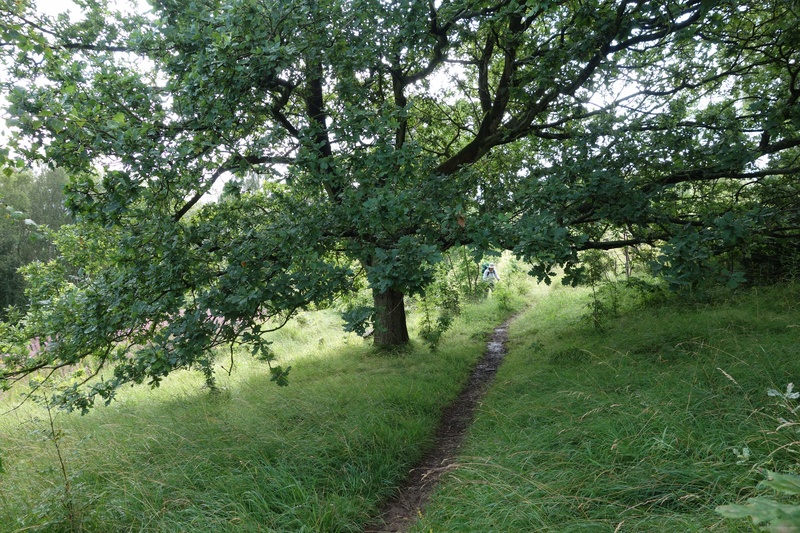 Macfarlane writes about the ancient footpaths and sea lanes in and around the UK, as well as in Spain, Tibet and the West Bank. His prose is beautiful and poetic and his adventures on foot and in small boats are entertaining and illuminating. It is supposed to be the final volume in “a loose trilogy about landscape and the human heart,” but I haven’t read the first two books, Mountains of the Mind and The Wild Places, and I don’t think you need to before picking up The Old Ways. I was so impressed by The Old Ways, though, that I intend to read the first two books as soon as possible. I can’t keep up with my “to read” pile and I blame Macfarlane for adding two more volumes to it. 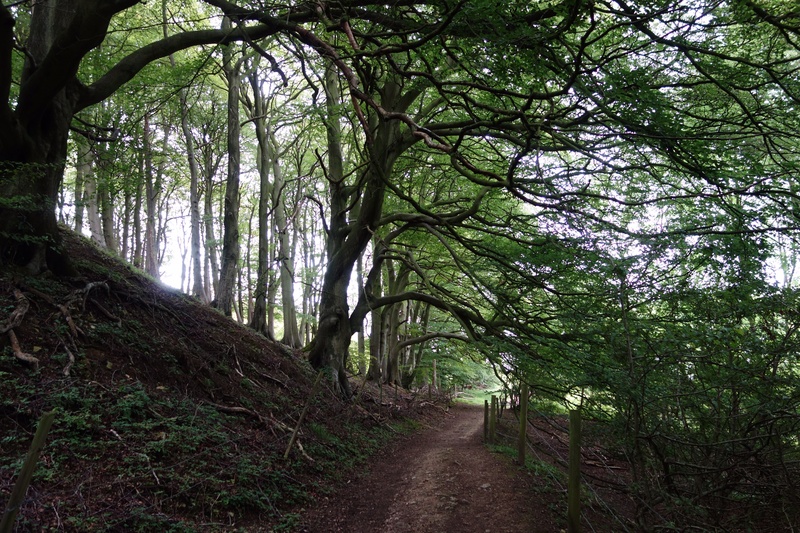 Closer to home, Macfarlane walks repeatedly along the Icknield Way, one of the oldest roads in the United Kingdom, which runs along a chalk escarpment from Norfolk to Wiltshire. He also walks the Broomway, also known as the “Doomway,” a path across tidal flats between Essex and an island called Foulness. It’s supposed to be the most dangerous walking path in England, because it’s easy to get disoriented (especially when its foggy), and since the tide comes in faster than a person can run, you can easily find yourself in serious trouble. For Macfarlane, the Broomway is utterly strange and, for that reason, impossible to resist. In fact, after his successful navigation of this bizarre, dangerous path, he immediately makes plans to walk it again, the next time at night. The Old Ways isn’t just about Macfarlane’s journeys (and, by extension, those of his friends). It’s also about other writers whose work focuses on or was deeply influenced by walking, most of all the poet Edward Thomas, whose work I had never heard of before reading this book. Thomas was a walker–it helped him manage the black moods that often overcame him–and his writing was deeply influenced by his walking. 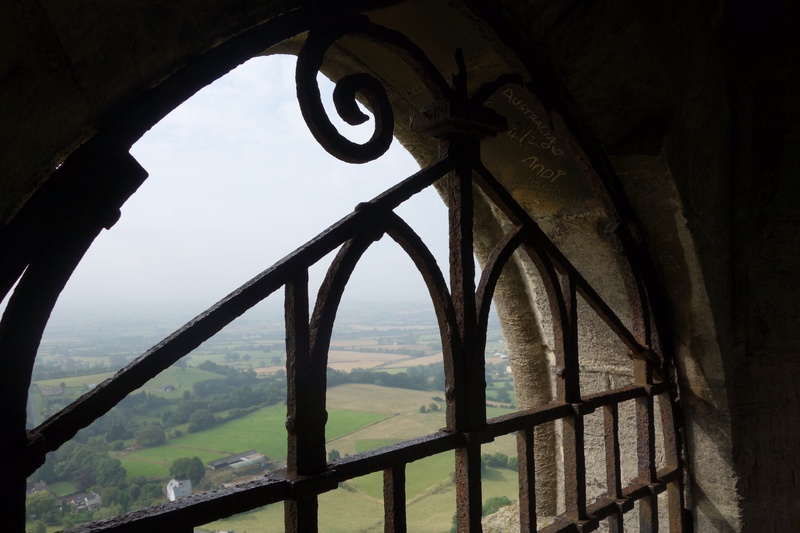 For Thomas, according to Macfarlane, “Landscape and nature are not there simply to be gazed upon; no, they press hard upon and into our bodies and minds, complexly affect our moods, our sensibilities. They riddle us in two ways–both perplexing and perforating us.” Again I add another set of books to the teetering stack that I intend to read. Inside the front cover of the paperback edition is a list of 15 writers for whom The Old Ways was the book of the year when it was published–including John Banville, Antony Beevor, and Jan Morris. 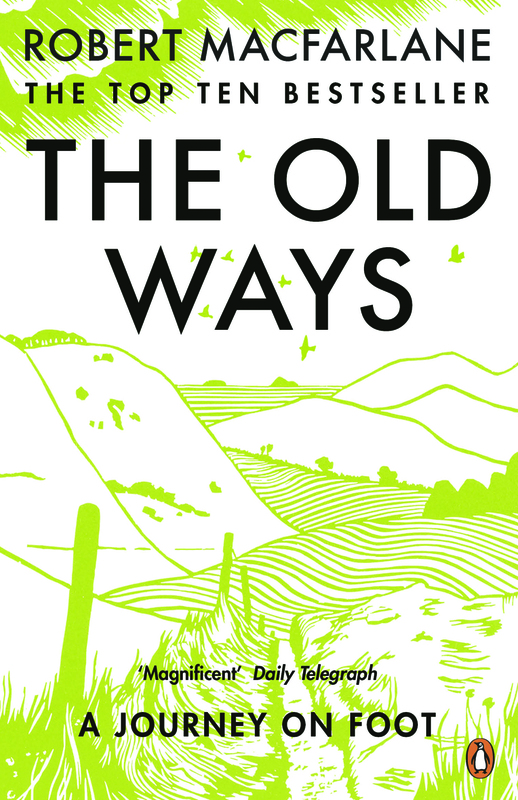 I don’t belong in such august company but I would have to say The Old Ways is one of the best books I’ve read this year and I would heartily recommend it to anyone interested in the complex relationship between ourselves and the landscapes through which we move. 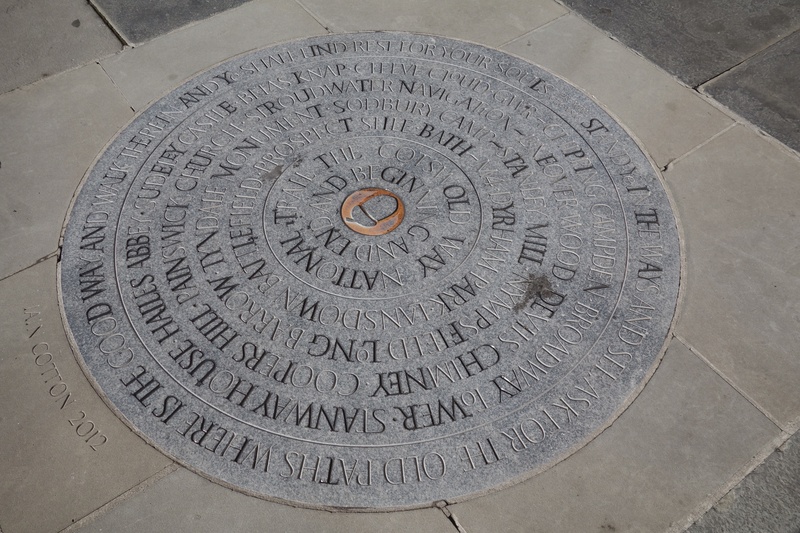 There is something in front of the Abbey to mark the ending (and beginning) of the Cotswold Way: a medallion in the pavement. We couldn’t see it for the other tourists milling about. 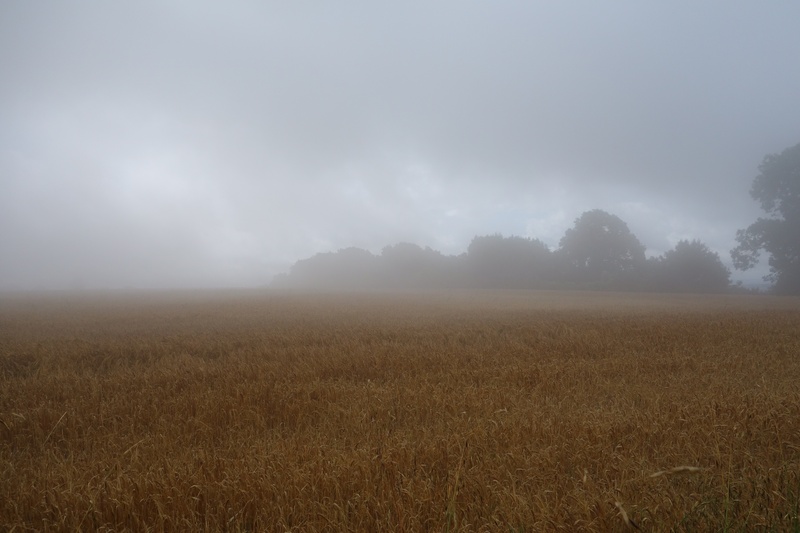 The weather today was, to say the least, unsettled: rain, then drizzle, then clearing, then cold fog, then rain and wind and then sunshine. 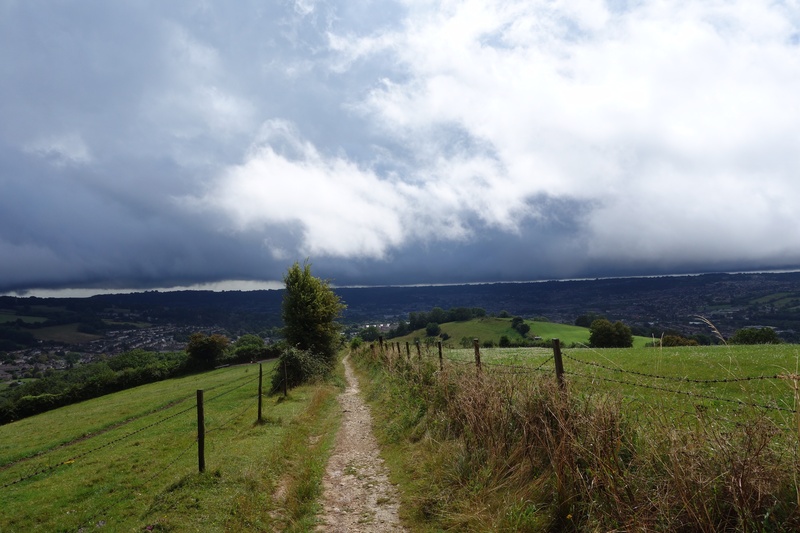 So when we arrived in Bath we were soaked, both from the rain and our sweaty raincoats, which keep one’s pack dry but don’t necessarily keep one’s self dry. 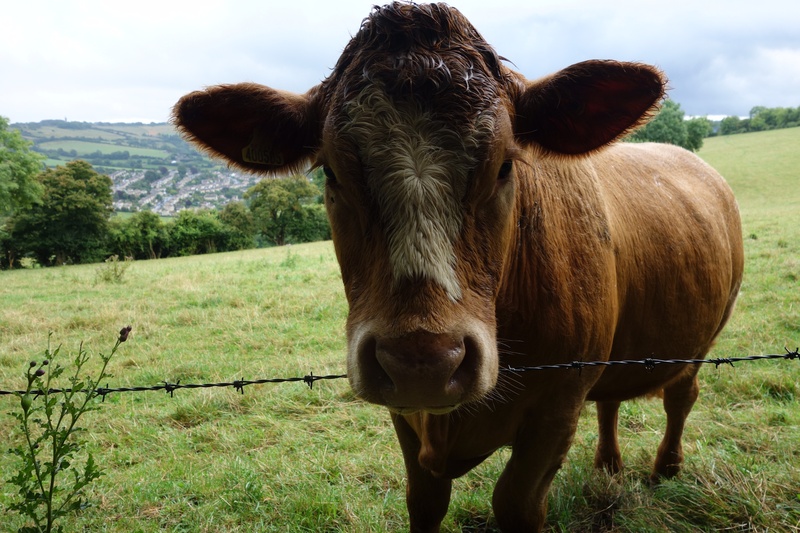 Our route took us through pastures on the heights overlooking Bath. We passed through a Civil War battlefield and two golf courses. Eventually we reached Bath’s suburbs. There the path took us on a circuitous route towards the old city. When we reached Royal Victoria Park, though, the way markers disappeared and our map became useless because it didn’t include any street names, just a vague squiggly line indicating our path. 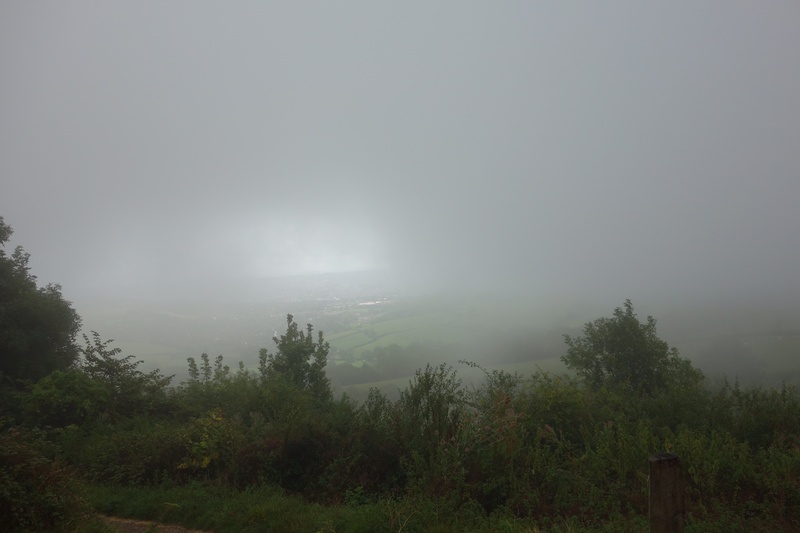 You wouldn’t think it would be hard to find the Abbey, the end of the Cotswold Way, but it was. Eventually, armed with a better map, we found our way there. 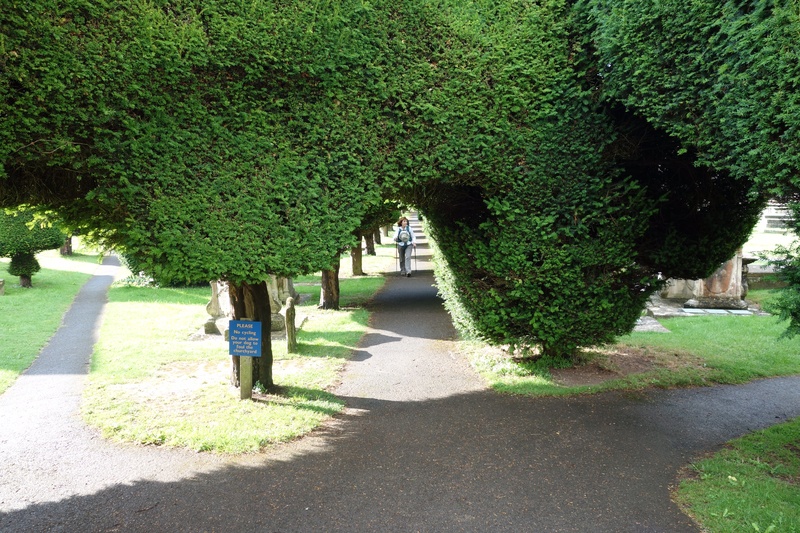 It was somewhat anticlimactic–there were no signs indicating that it was the end of the Way and the Abbey itself was closed to visitors–but that’s not unusual. I remember that I didn’t know I’d reached the cathedral in Santiago de Compostela at first. If the purpose of the journey is getting to the destination, not the destination itself, then arriving has to be somewhat disappointing. We had a beer in a pub and found our guest house. I watched two episodes of Fawlty Towers on the plane but hadn’t met Basil Fawlty until we arrived here. Well, that’s not entirely fair; one of our hosts regaled us at length about the faults of his neighbours and other drivers and the local council. He was pretty close. Anyway, when we got to our room I sat on the bed and it broke. The slats had been repaired before, poorly, and at least one was missing. I might end up sleeping on the floor. Now we are tourists rather than walkers (to the extent that there’s a difference). Our muddy walking clothes and boots will go away (after they’ve dried out) until we get home. Our walking sticks will get taken apart and put into our backpacks. There is a guided walking tour of the city and we’re planning to take that, but that’s not the same, is it? We have two days in Bath and then we’re heading for home and until then we’ll see what we can of the city and take a trip out to Stonehenge. 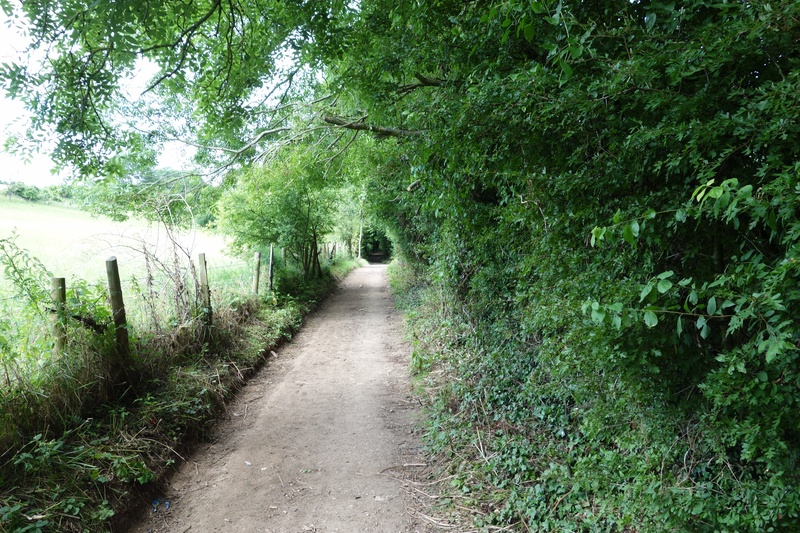 But our walk of the Cotswold Way is over and that’s a little sad. There was no wifi yesterday and I was too tired after our longest walk to do much more than walk to the pub for dinner at the famous Beaufort Arms. We were told, “People drive there all the way from Bristol!” I can believe it. It was hot and very humid for most of the day yesterday and then for some reason the humidity eased late in the afternoon. We ate a picnic lunch on a bench across the road from a church where a soldier and his gal were getting married. It seemed as if every young person in the village was there in their finest clothes. We shared a bottle of strong ale which didn’t make it any easier to climb the afternoon’s hills. 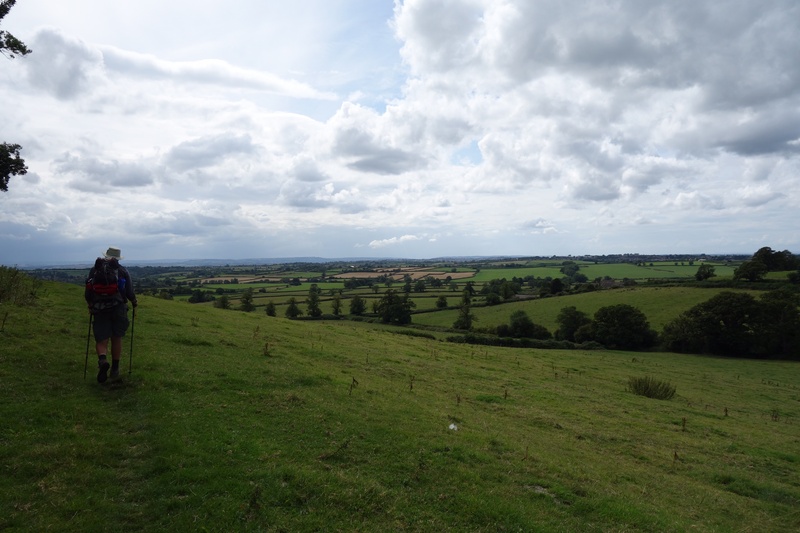 The hills are, as my friend Geoff suggested, getting easier as we get fitter, but also, let’s not forget that the Cotswolds get flatter as we get closer to Bath. Still, it’s an accomplishment to reach the top of the biggest ones even if I’m sweaty and gasping. The big breakfasts and pub lunches don’t help. Clearly I’m going to have to spend the winter on the stairmaster before next summer’s walk, whatever that’s going to be. 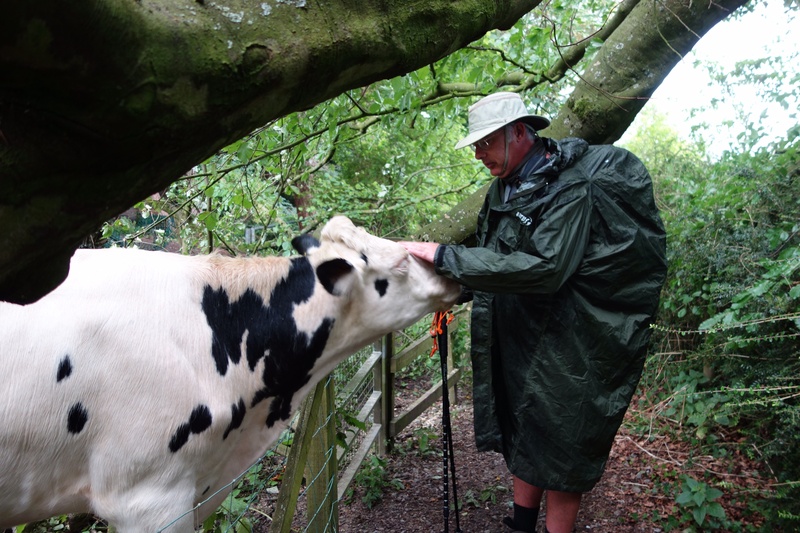 Despite the talk of bulls, angry cows, wild boars, adders, etc., the biggest hazards we’ve encountered have been stinging nettles, which are everywhere, and low doorways and low-hanging branches. A phrenologist would have me committed because of all the lumps on my head. Oh, and English drivers. We crossed the A46 several times today and each crossing was terrifying. Outside the village of Pennsylvania, where drivers are supposed to slow to 40 miles per hour, they were travelling closer to 75. I would hate to live there, with cars going that speed past my front door. This country could do with a little photo radar. There are CCTV cameras everywhere already, so why not use a few to make the roads safer? We also crossed the M4 today, and the endless stream of vehicles speeding towards Bristol and then Wales made me think about the difference between travelling that way and walking. Driving down an expressway is faster but it’s also a kind of suspended animation, while when we walk we’re very much alive to the sounds and sights and smells of the world around us. 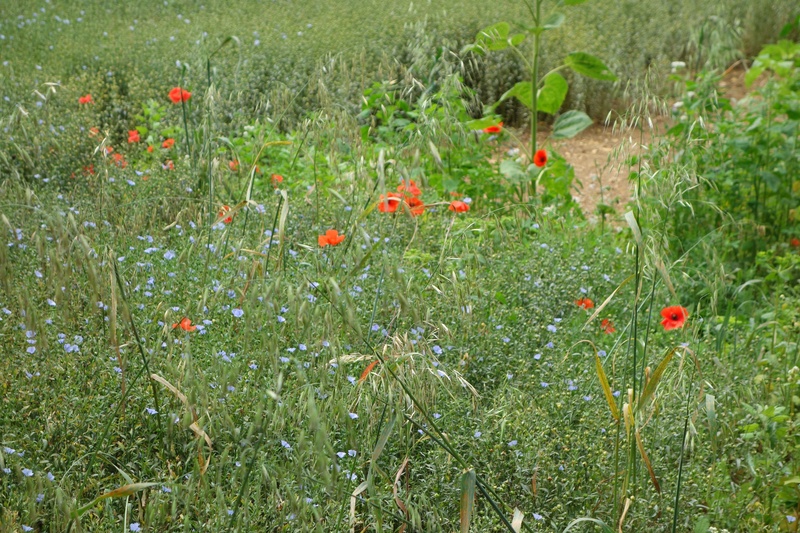 I thought about this walking along the edge of a field of harvested sunflowers. 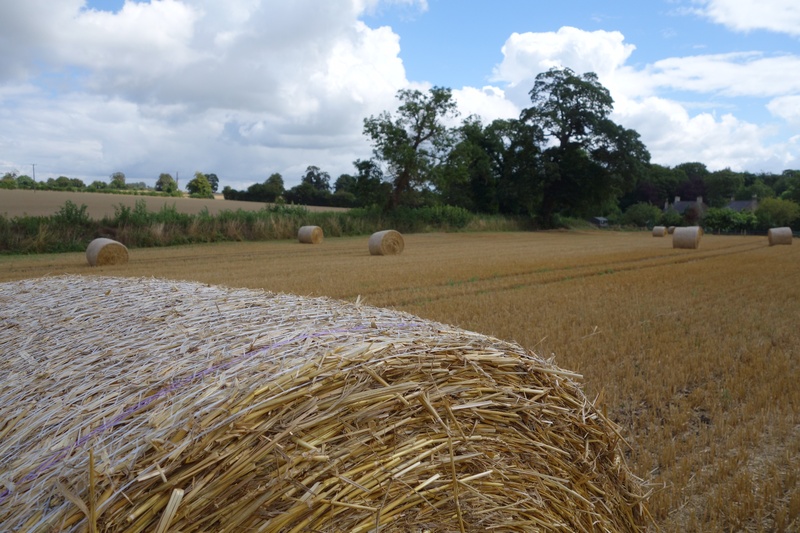 The grass at the edge of the field had been cut, too, and it smelled like fresh hay. 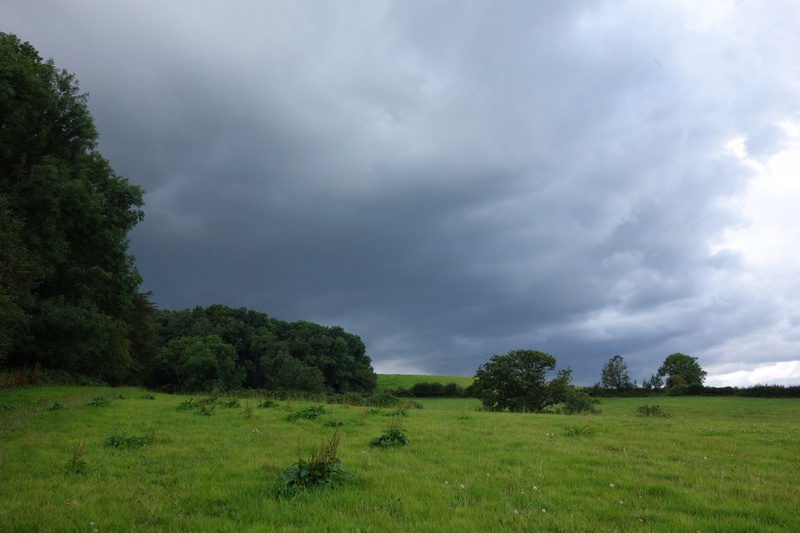 The wind was singing in my ears and in the next field, a pasture, sheep were bleating. It was wonderful. From here, we could be in Bath in 15 minutes but it’s the experience of walking that’s the point, the journey and not the destination. Or something. 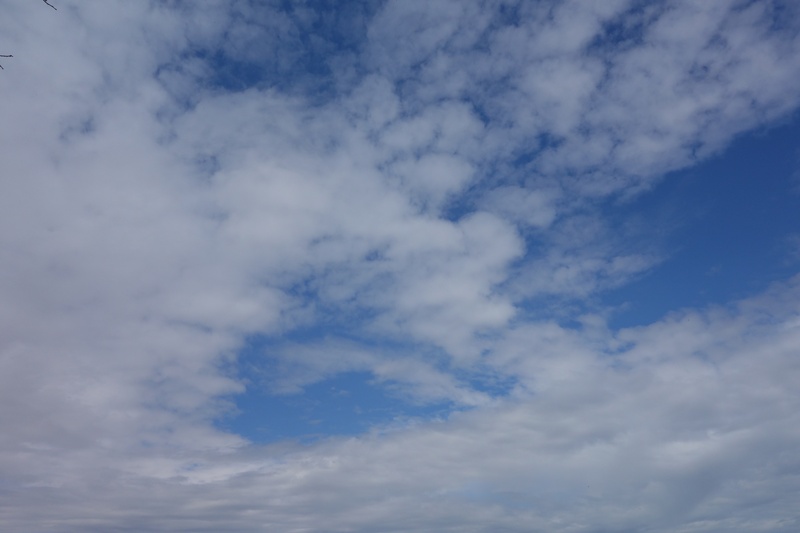 This morning it rained on and off, and then late this afternoon the skies opened up and the rain simply poured down. Once again my boots filled with water because I forgot my gaiters back home. 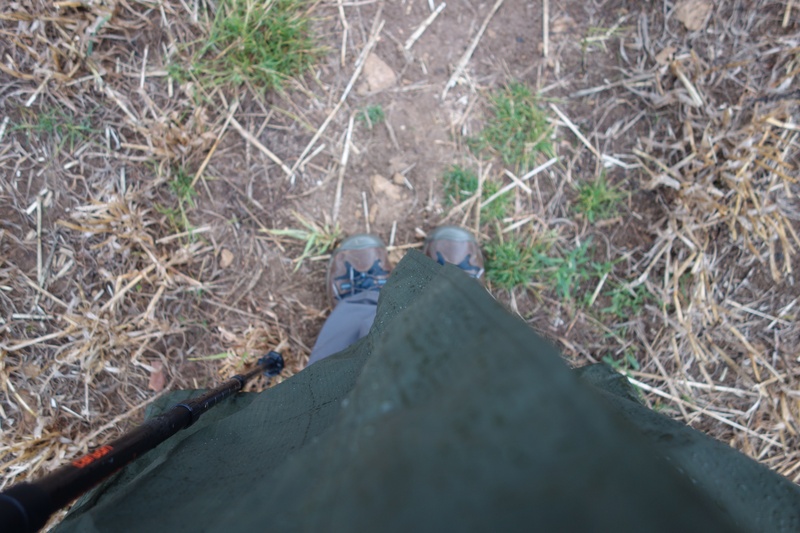 This never happened in Spain and I didn’t have gaiters there either. What a conundrum. I was able to ponder it as we splashed towards Cold Ashton. Our B&B is the first we’ve encountered that’s set up for walkers, with space to dry wet clothes and a machine for drying sodden boots. 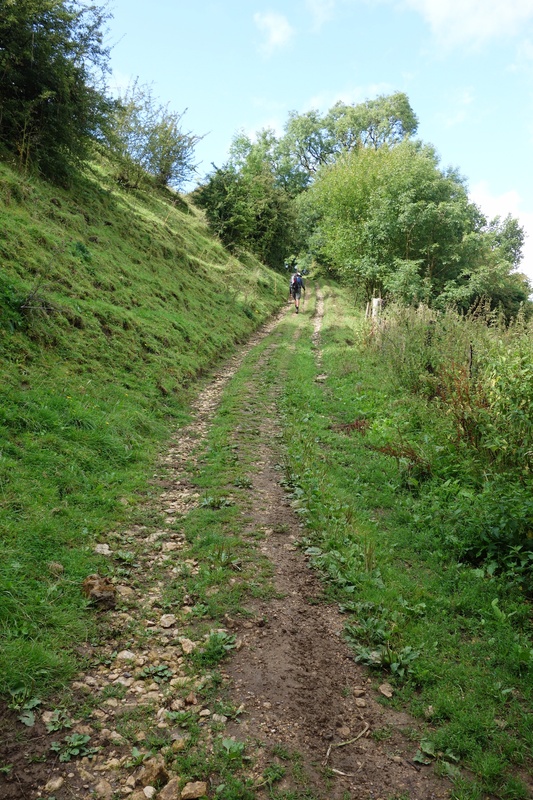 The owners walked the Cotswold Way before they opened up last year and it shows. We’re in the middle of nowhere so dinner is provided, but we do the cooking ourselves. Interesting concept. It’s all very nice and there’s beer, too, which is exactly what tired and thirsty walkers need. After all, we walked about as far as we did yesterday and deserve a reward after our exertions. 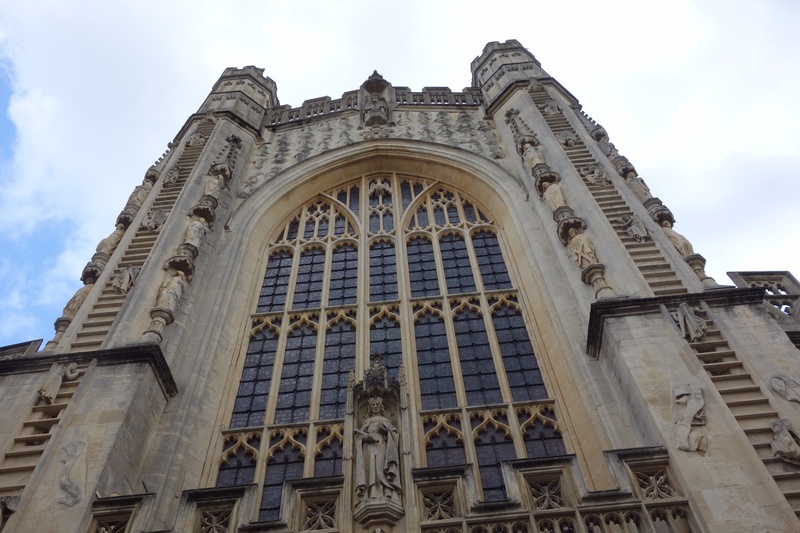 Tomorrow we will be in Bath and our walk will end. I wish we could keep going–I’m just getting into it. According to our guidebook, Dursley has been destroyed by urban planners but I saw little evidence of it. It’s just a regular town–not Cotswolds pretty but okay in its way. I’m not sure why it has a bad reputation. We did get lost but that’s not the town’s fault and everyone was quite nice to us. 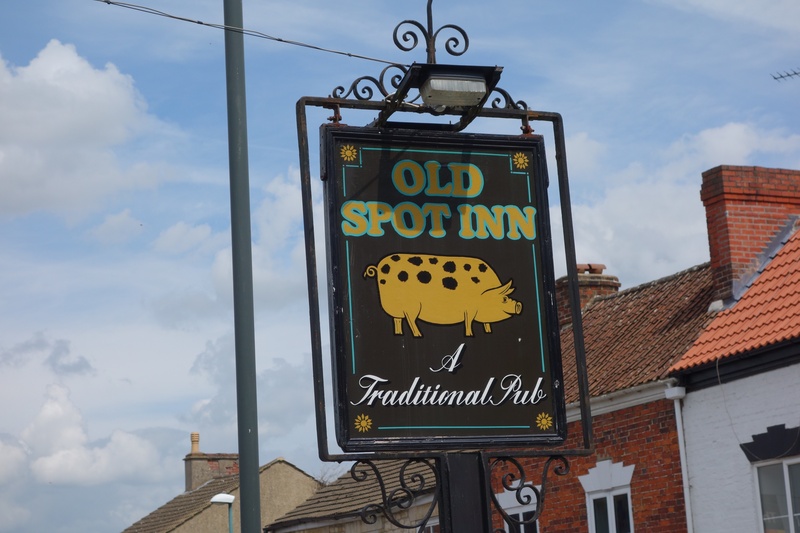 We had a tremendous lunch at the award-winning Old Spot Inn–supposedly the best pub on the Way–and unfortunately it doesn’t serve supper. 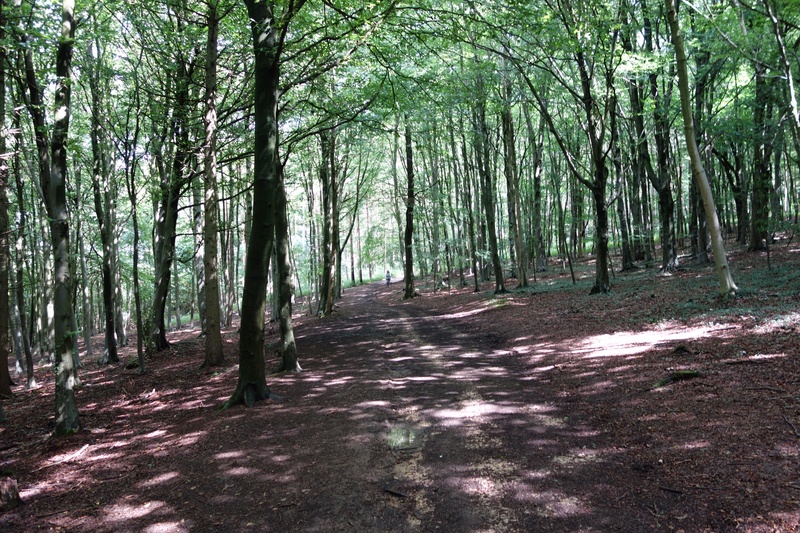 We left Middleyard early after another huge breakfast (between full English breakfasts and real ale I’ll have to buy new trousers when I get home) and after a long climb through a forest we arrived at Coaley Peak. There was an amazing view of the Severn River valley, all the way to the Channel, including (according to the sign there) Tintern Abbey. 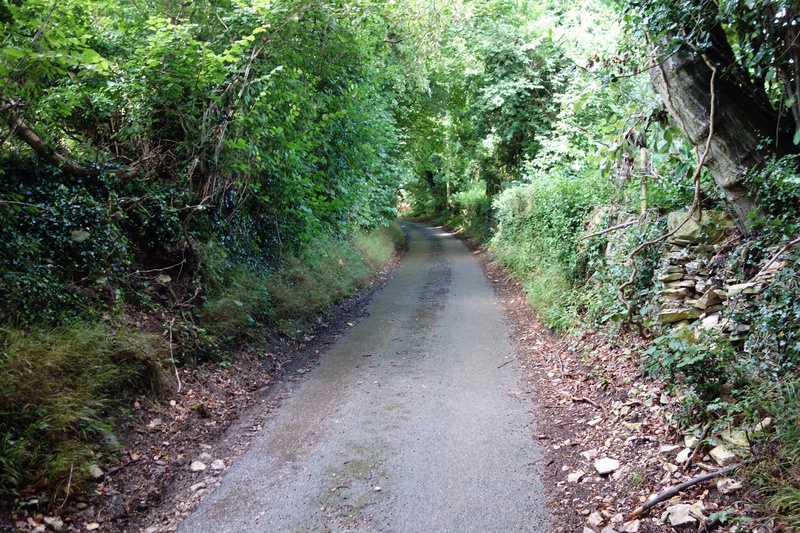 Wordsworth was a indefatigable walker, apparently, unlike me–I get fatigued, but not today, not on this short, 13 kilometre stretch, the shortest of our tour. Then a coursing hawk reminded me of another poet and his sparrowhawk: “I caught this morning morning’s minion, king-/ dom of daylight’s dauphin, dapple-dawn-drawn Falcon” and so forth. “The Windhover” has long been one of my favourite poems. I shouldn’t “and so forth” it but typing on the iPad is tiresome and you can always look up the rest. Then it was back down into the valley. 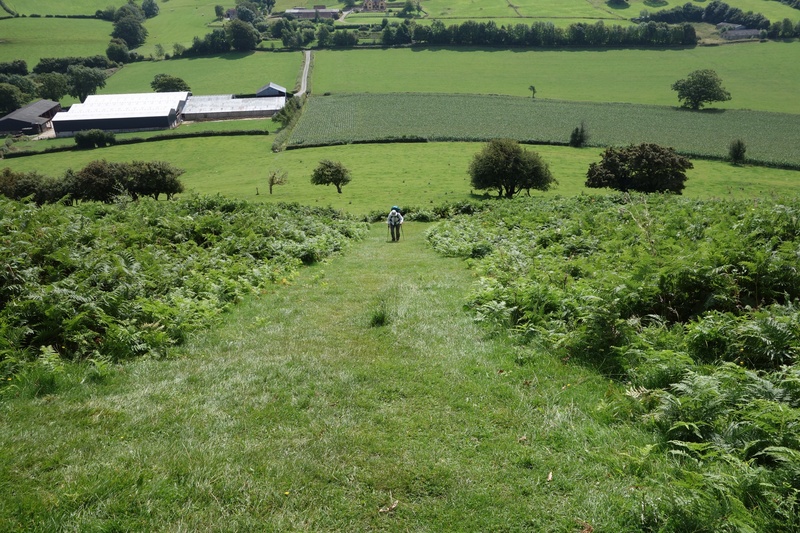 Two miles from Dursley, we turned for another stiff climb up to the top of Cam Long Down, and then we had another descent into the town. We passed another long barrow at Nympsfield. 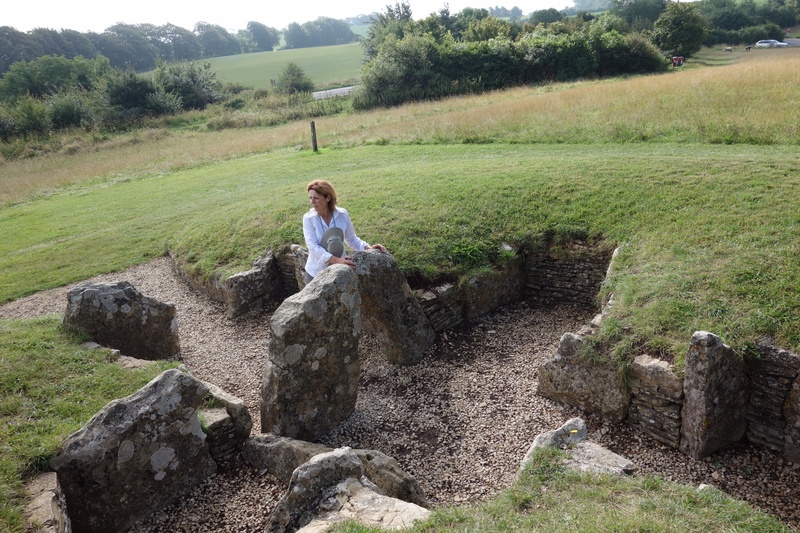 this one was missing its roof so we were able to see how the burial chambers were arranged. 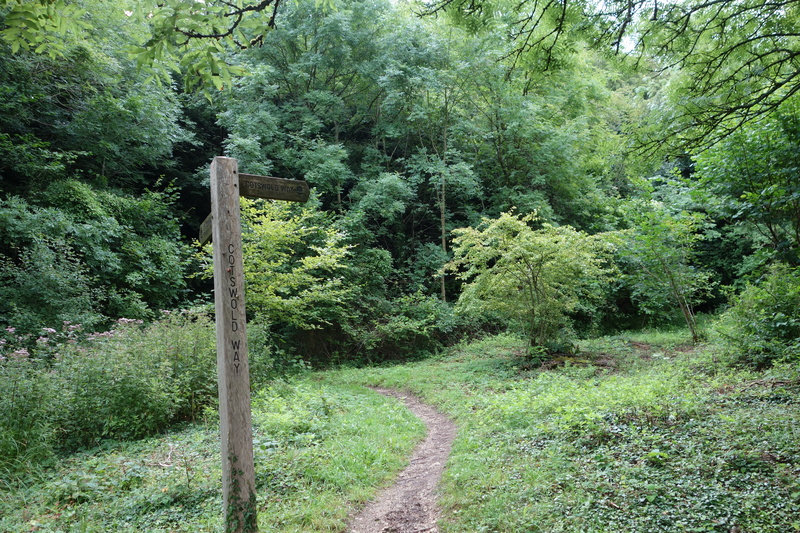 We missed another, the strangely named Hetty Pegler’s Tump, because the only path to it leads I. From the road, not the footpath, and we didn’t understand that until it was too late. Christine was disappointed. You can crawl right into the caverns there and I think she wanted to do that. Not me. I’m not going into someone else’s tomb even if their bones were removed by Victorian anthropologists. No thanks. anyway, lesson learned–read the guidebook more carefully. After lunch, we wandered around Dursley for a while. Christine had coffee and went window-shopping and I looked for reflector tape to put on our raincoats (a motorist stopped a few days ago and told me we were next to invisible on the road). the bicycle shop didn’t have any. they suggested I try the motorcycle shop, which was closed. so no more walking along the road in the rain unless we absolutely can’t help it. Maybe I’ll use my headlamp–that’s why I brought it. Our B&B is up on another hill south of Dursley. Our directions were rather poor and we had trouble finding it, but it’s very nice. It’s in an Edwardian estate. There are dogs and horses and chickens and our host served us elderflower water and cake. 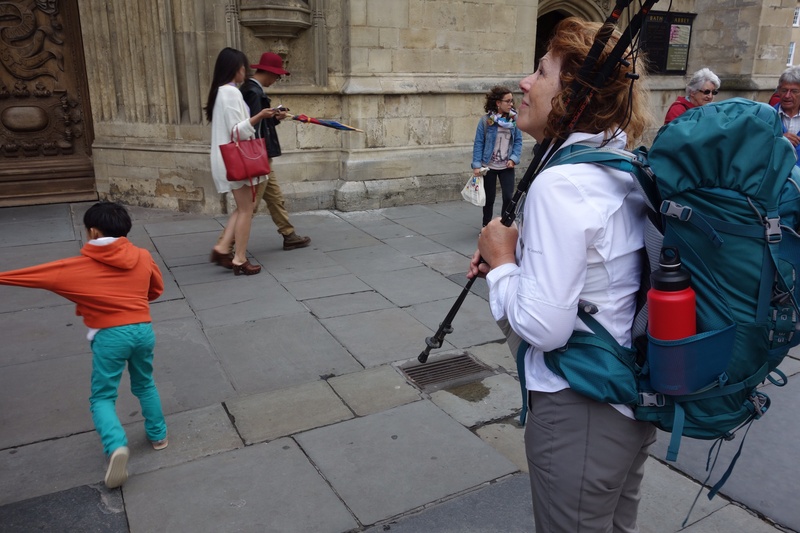 Then we had a chat with another pair of walkers, an English couple who are walking the Cotswold Way in stages, as day trips. it was the first time we’ve had an extended conversation with other walkers and it reminded me a little of the way peregrines talk to each other on the Camino. Neither of us has much of an appetite after our huge lunch, so we’re planning to have a little picnic instead of heading back into town for supper. Then it’ll be an early night, since tomorrow is our longest day of walking on this trip. Our hosts last night had a book on the shelves in their hallway: 50 Crap Towns in the UK. Painswick, the village where we were staying, definitely wasn’t one of them. It was yet another picture-postcard Cotswolds village. Middleyard, where we are tonight, is a little more down-to-earth. It’s a suburb of Stroud. The pub down the road where we ate dinner is more like the pubs I remember from previous visits to Britain: a little shabby but good enough. We had two odd animal encounters today. 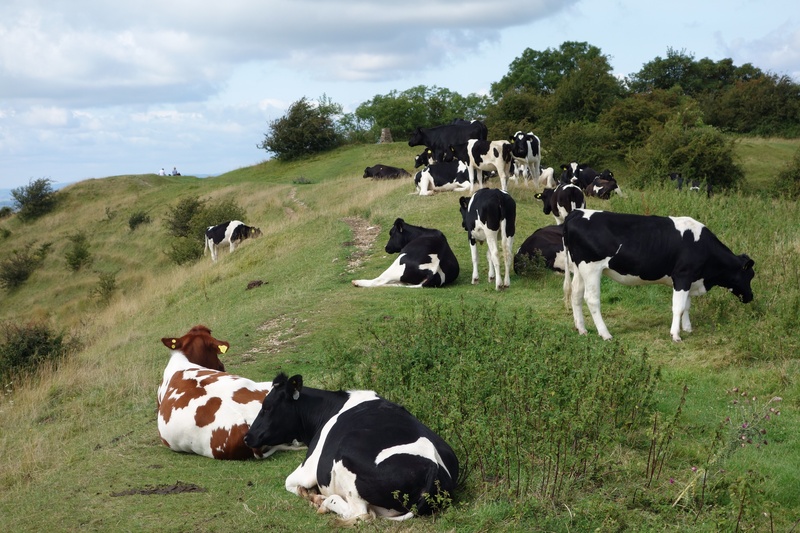 At Haresfield Beacon, a lookout point with 360-degree views of the valley below, a herd of cows was occupying the footpath. They were reluctant to share and snorted ominously as we approached. I was mindful of the story about the woman in Lincolnshire who was trampled to death by an angry cow while walking and avoided making eye contact while murmuring “that’s a good cow” in what I hoped was a reassuring voice. 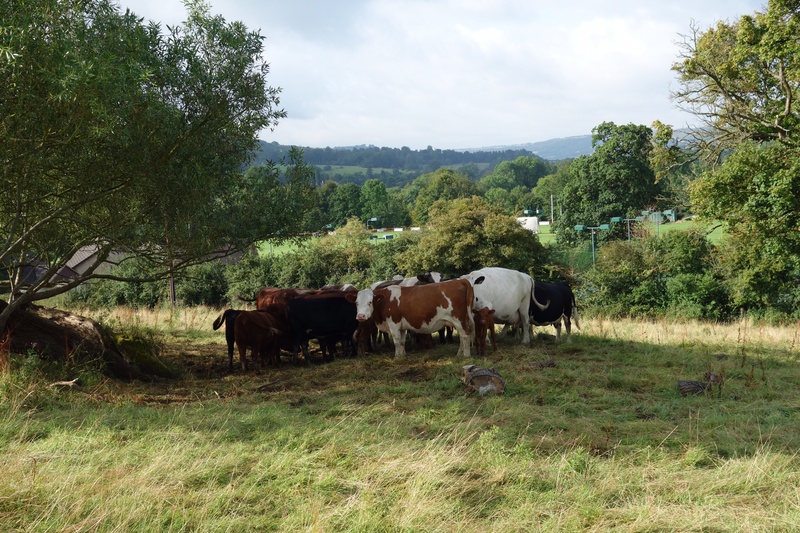 We were between the cows and the escarpment, which didn’t make me feel any better. But they were only bluffing. 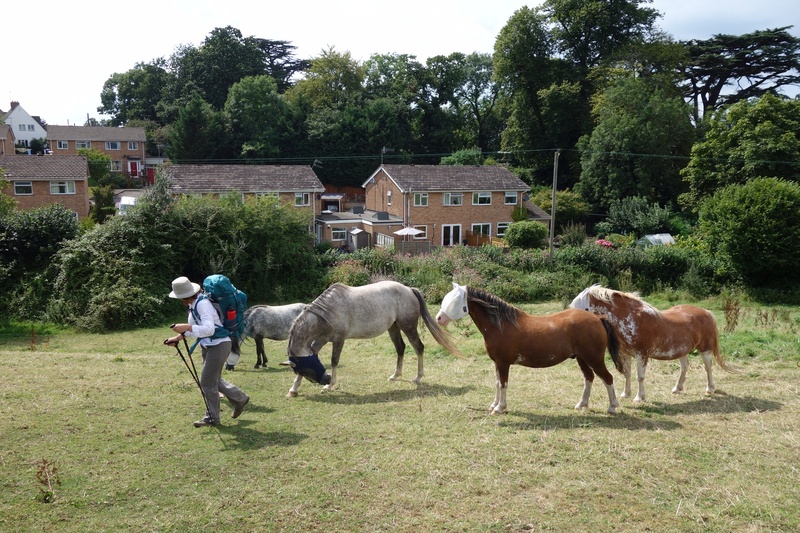 Later, as we entered King’s Stanley, a horse became convinced that Christine was harbouring something edible and followed her, mumbling her pack and slobbering on her water bottle. 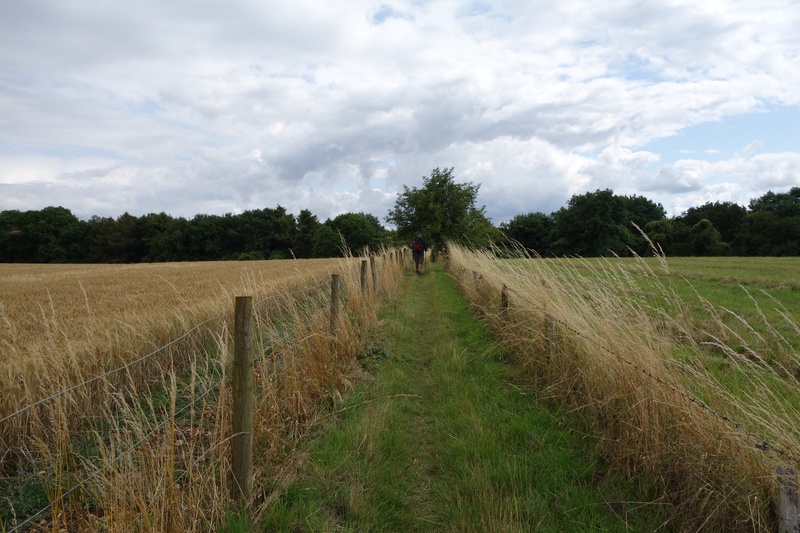 Our route today took us along footpaths and bridleways and restricted byways; through ginnels, snickets, closes and alleys; along roads and highways and streets; through woods and forests; on bridges across streams, railway tracks, a river; over pastures, through a wheat field and a hop yard. Unlike the Camino Francés, much of this trail is on private land, something that continues to amaze me. Imagine Canadian farmers putting up with strangers wandering across their pastures and through their farmyards! I can’t. Tomorrow is our shortest walk on this trip. 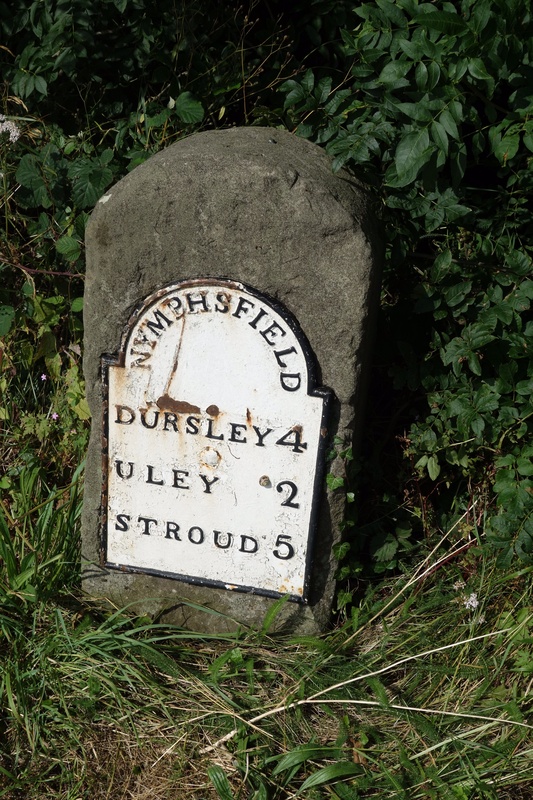 Our destination, the village of Dursley, is the inspiration for the name of Harry Potter’s adoptive family. We’ll see if it’s as cruelly repressive and miserable. It rained on and off all day. Whenever I thought it might stop, it would start again. I stopped to take a pee after we entered a National Trust forest and was surprised by the sudden appearance of a woman walking her dog. It turned out that the paths through these forests are popular routes for dog walkers and most of the people we saw were accompanied by their canine companions. 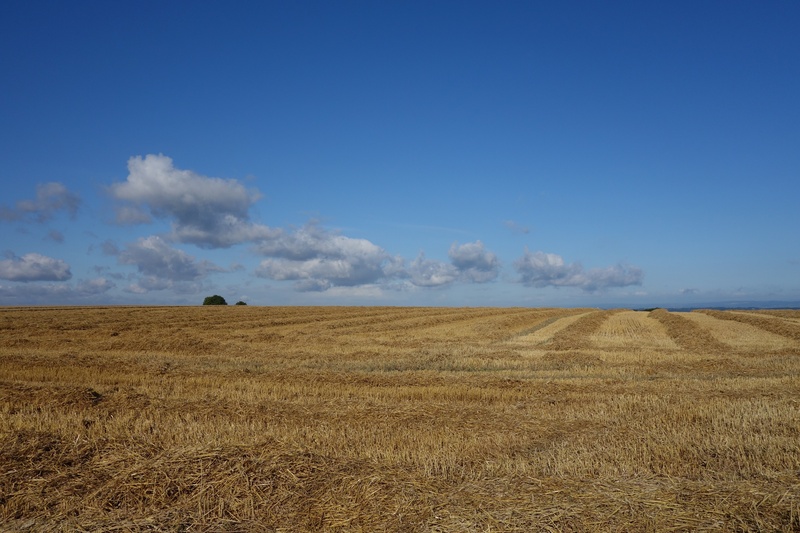 We walked through the site of a Stone Age fort and then got lost. We’d taken the wrong path and were headed in the opposite direction. Unfortunately, the right direction meant crossing a very busy roundabout. I saw a gap in the traffic and ran for it. Christine was trapped in the centre of the roundabout for ten minutes until a kind driver stopped for her. 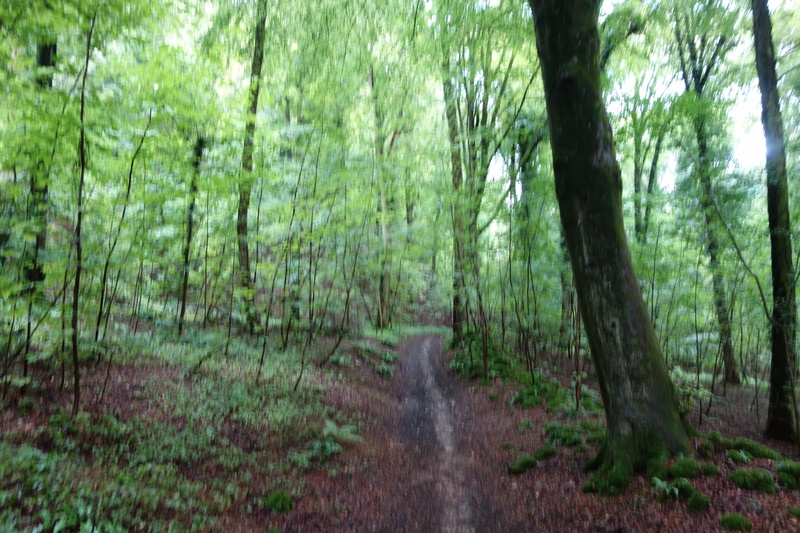 Then we were into a beech forest. 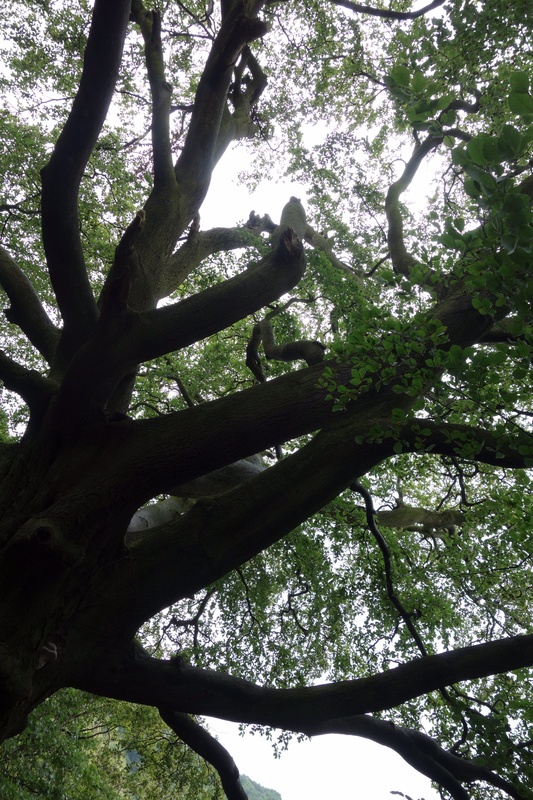 Christine loves the mood the old beech trees create and these forests have become her favourite places to walk. 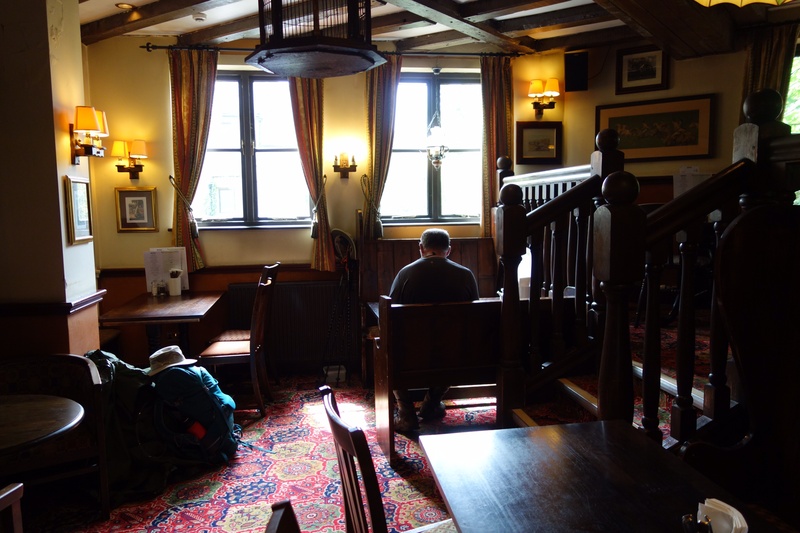 Then it was off the path and up a hill to a village where we’d been told we’d find a pub for lunch. It was one of the big pubs run by Greene King, a brewery. It’s become very difficult for ordinary pubs to survive on selling beer and bar snacks (stricter enforcement of drunk-driving laws and a ban on smoking inside bars and restaurants have encouraged many of their customers to stay home with cans of cheap lager) and most of the pubs we’ve seen have been like this one, more like fancy restaurants or hotels. Food’s good, though. 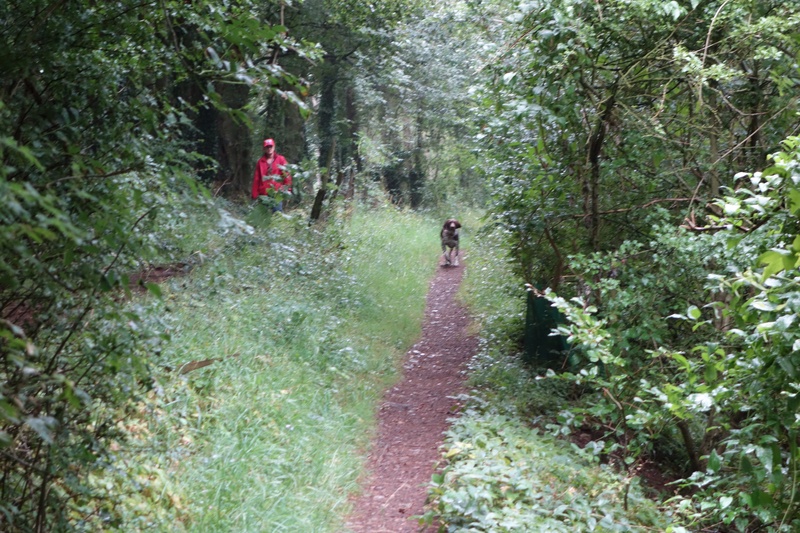 In the afternoon we walked through a thick forest which kept us dry. We could hear the rain but little penetrated the dense canopy of leaves above us, so we were able to put our rain gear away. 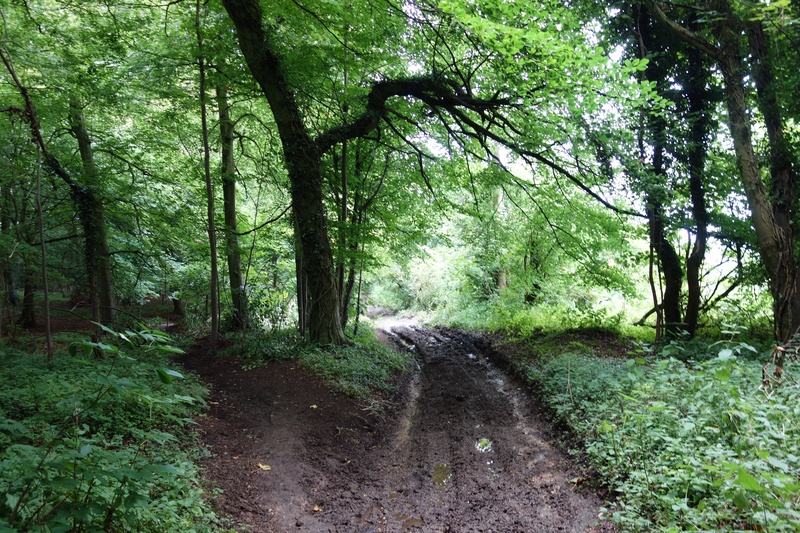 we made a long, muddy descent on some kind of forest access road, past a fenced clearing where the trees had been recently coppiced–cut close to the ground so that they begin to grow new shoots. The new growth is a favourite food of deer, who have to be kept away or they will eat all of it and kill the trees. Eventually we began a long, muddy climb, proving that what goes down must also come up. There were more hills to come and we were very tired when we found another pub. This one had an espresso machine and we drank coffee and ate cookies in our muddy clothes and boots. Then we pushed on, across a very tricky golf course where you couldn’t see any of the greens from the tee, and eventually into the village of Painswick. We ate a delicious dinner at a restaurant populated by moneyed Londoners and then went back to our B&B where we slept heavily. 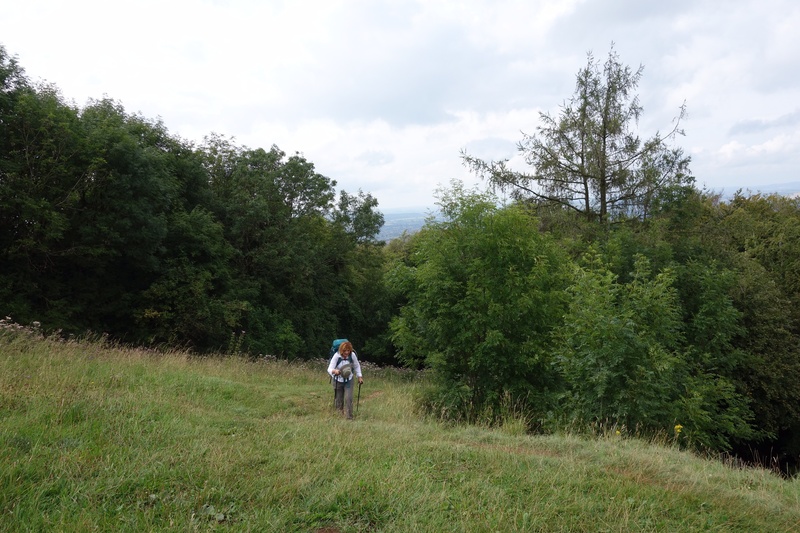 Our walk was only 20 kilometres but with the hills it seemed much longer. Our speed was a frankly embarrassing three kilometres per hour. Even allowing for frequent map checks and stops to admire the view, that’s a pretty poor performance. However, like Geoff says, this is the adjustment period, where we get used to climbing hills, and in time they will get easier. I was still tired from yesterday’s hills when we left this morning. 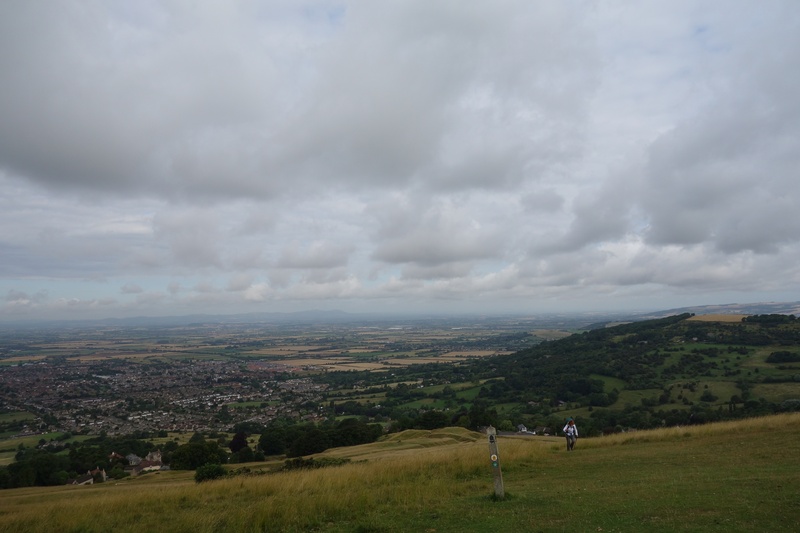 Our first challenge was a steep climb to the top of Cleeve Hill common, where we were rewarded with spectacular views of Cheltenham and, in the distance, Gloucester, the Black Mountains and the Malvern Hills. 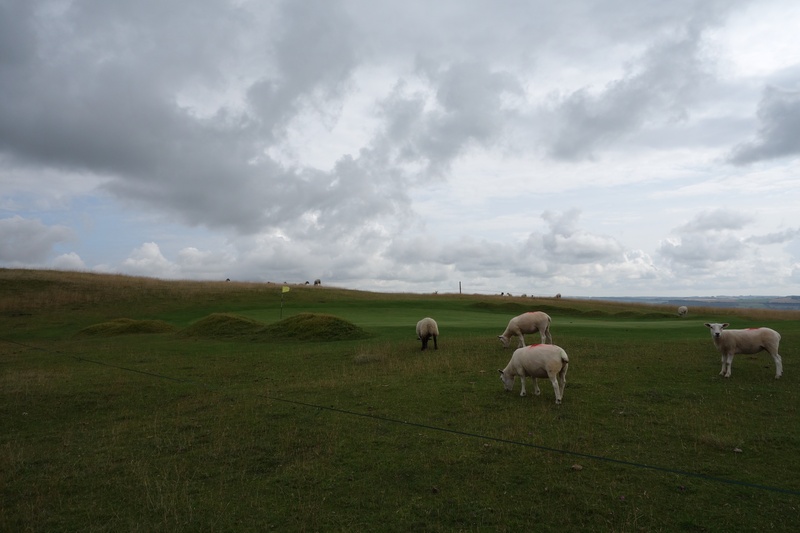 There is a golf course on the common with sheep grazing on the greens. 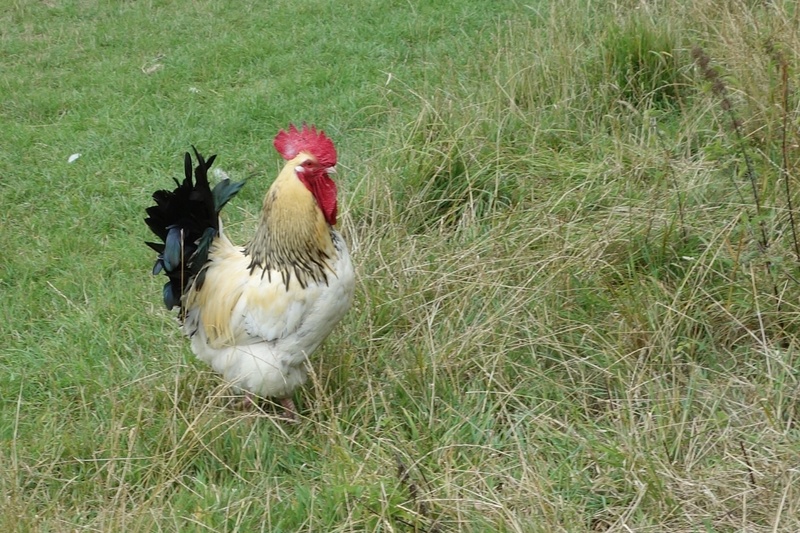 Please don’t hit any livestock with your ball, or any walkers trying to get past the 14th hole. 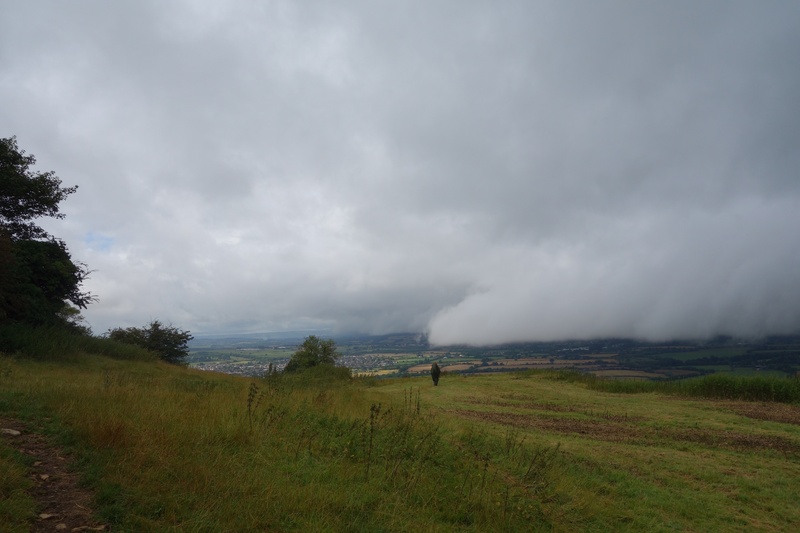 Then it was a long trek across Cleeve Hill, through a nature reserve, into a valley and then up another hill on the other side. 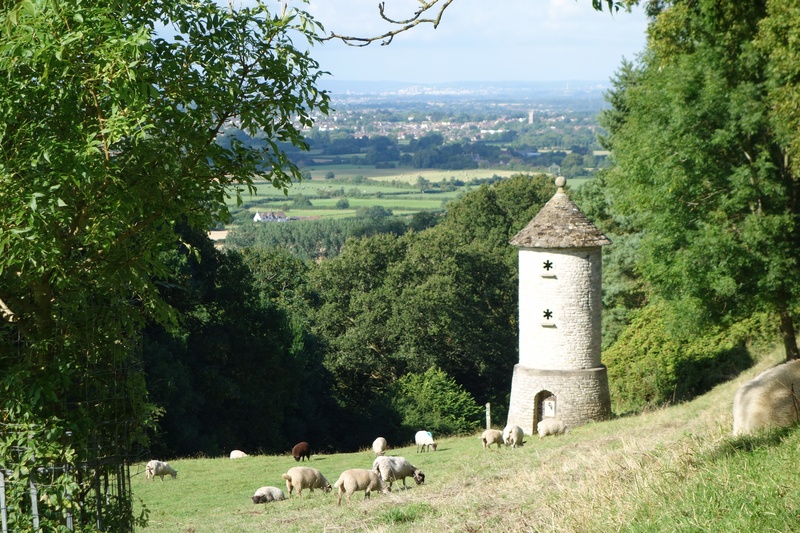 Late in the afternoon we reached Leckhampton Hill, the point where the people from our B&B were to pick us up and drive us to their farm. It was only 15 kilometres, according to the guidebook, but with the hills it felt like much longer. 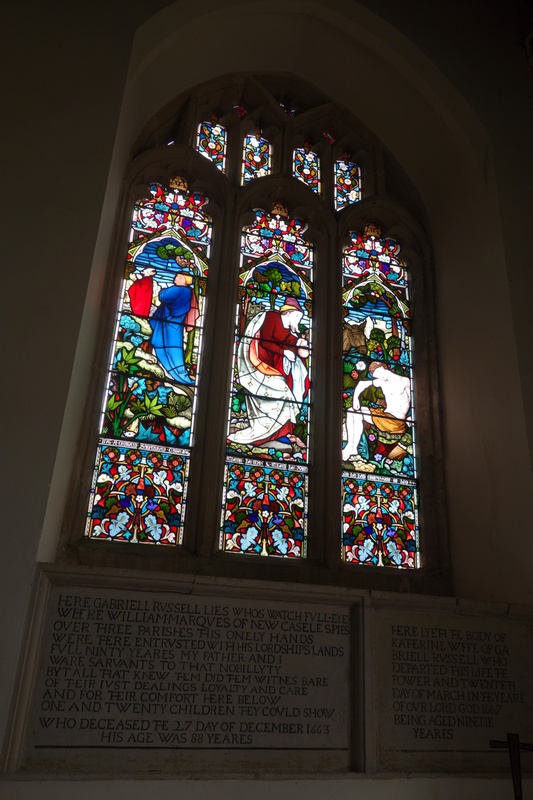 Our route took us around the city of Cheltenham, birthplace of Gustav Holst and Brian Jones, which disappointed Christine. However, we had many opportunities to see it from a distance as we walked. 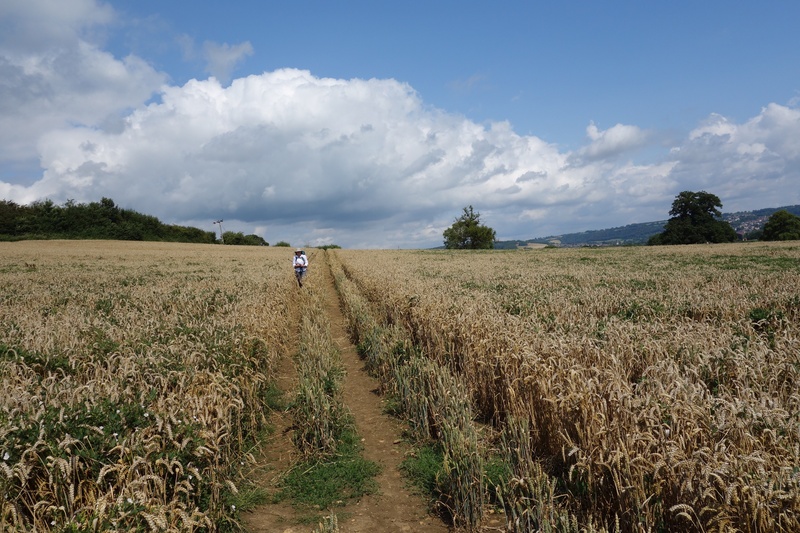 We saw many people out for a stroll in the late afternoon, but few who looked like they were attempting the Cotswold Way, which rather surprises me. 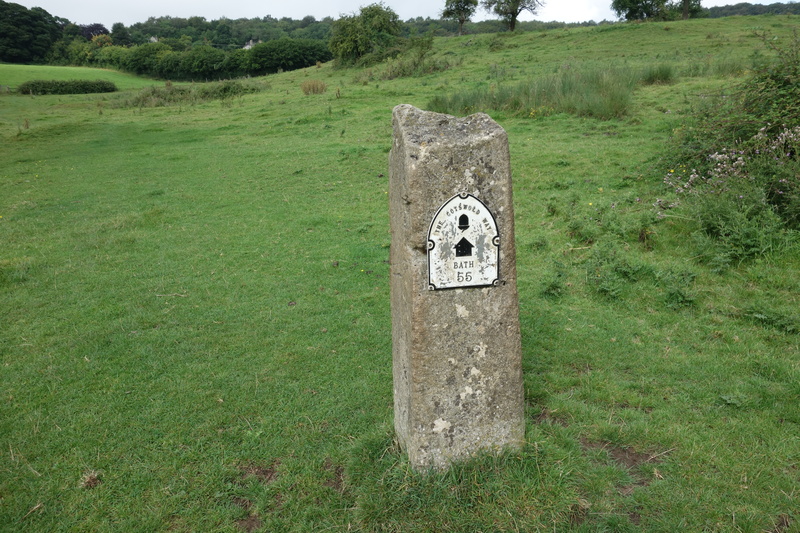 We did see a couple with backpacks at Belas Knap, the Neolithic burial site, yesterday and another couple this morning on Cleeve Hill common, but given the density of inns and B&Bs around here I had expected more walkers. 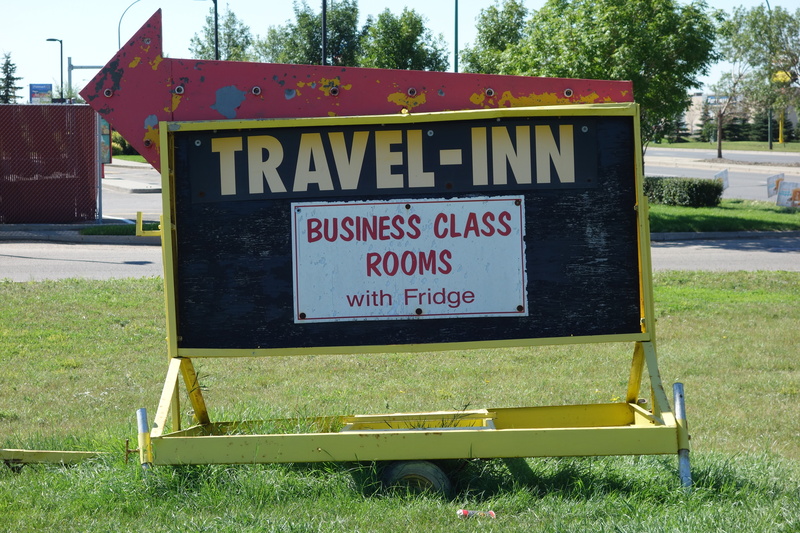 I suppose most tourists are sane and drive from place to place. Now we’re waiting for a lift to the local pub for dinner. 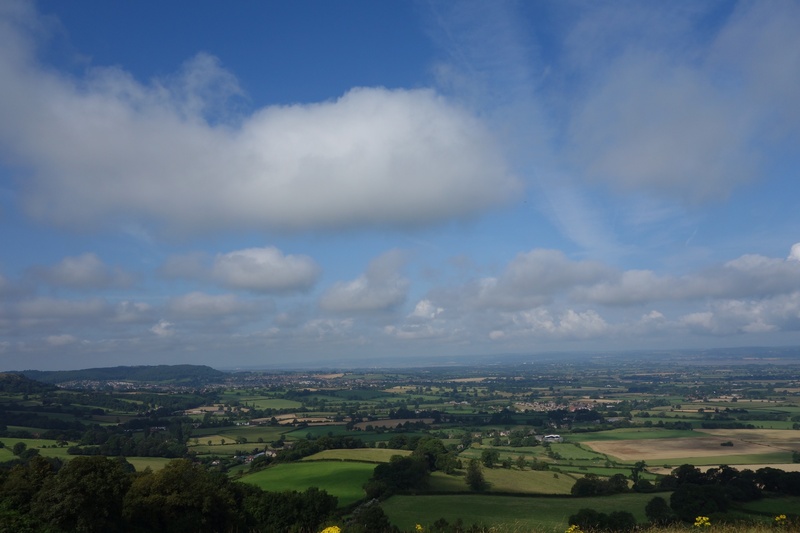 Tomorrow we return to Leckhampton Hill and walk to a little village called Painswick. There’s a pub in Birdlip, the halfway point, so we won’t have to picnic in the rain, the way we did today. 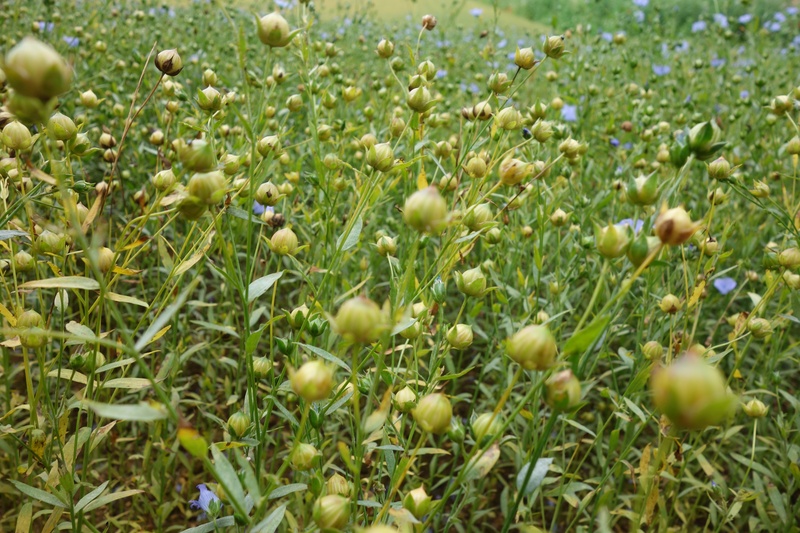 Still, the rain does make the flowers grow. Speaking of which, we passed through endangered grasslands today, home to rare species of wildflowers and butterflies. According to the guidebook, most of these grasslands have been ploughed under in the last 70 years. 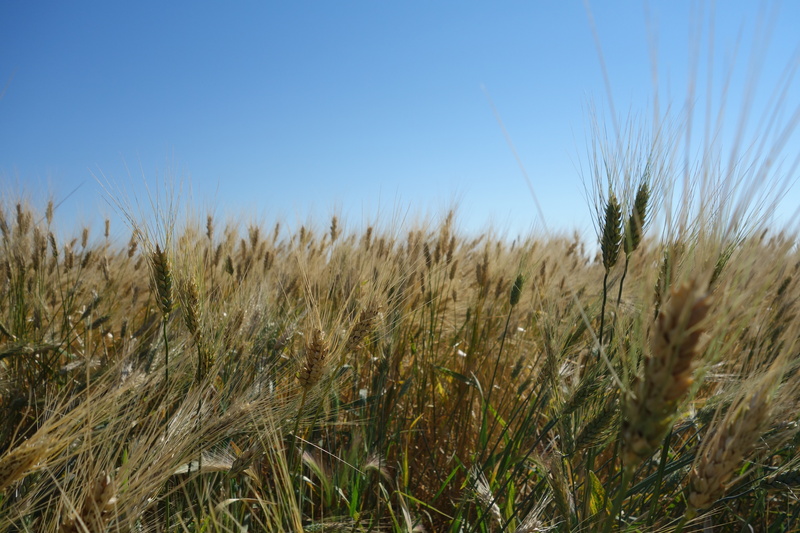 All of that would’ve been on private land–a foretaste of what is to happen after our provincial government sells off the community pastures back home.